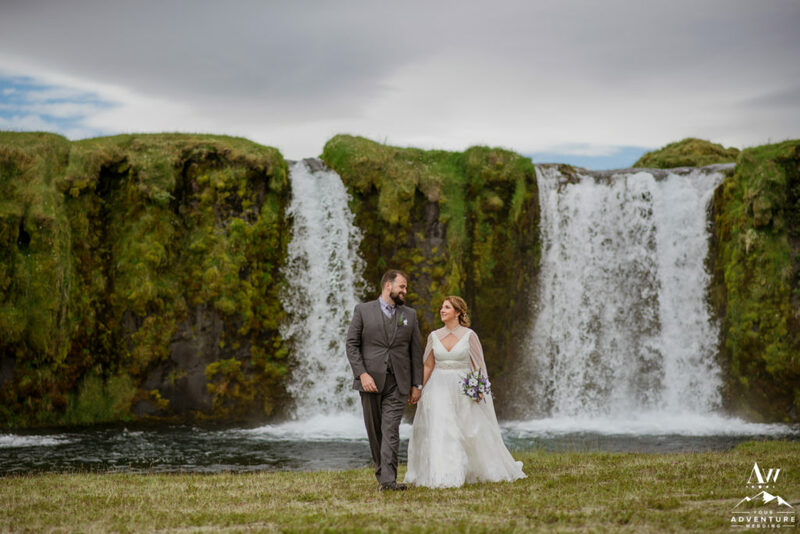 Allow me to introduce you to one of the coolest couples we have ever had the pleasure of planning an adventurous wedding in Iceland for… The Wandering Wolfes, Brandi + Zach! 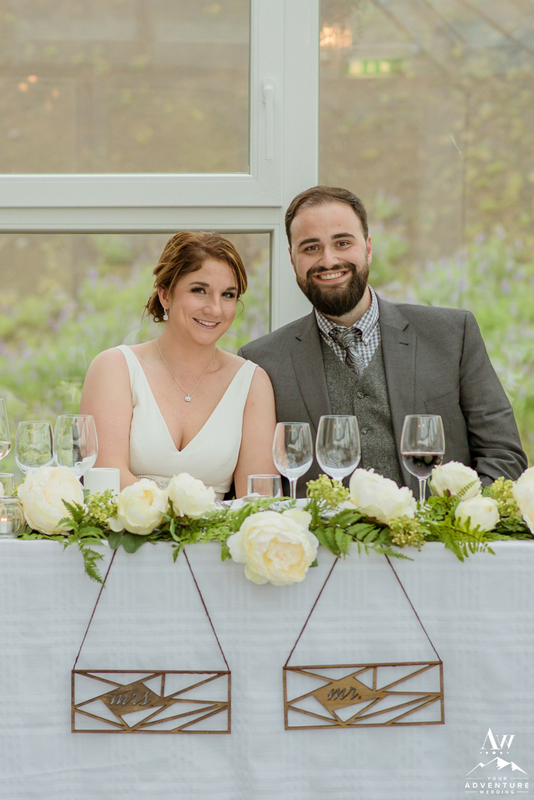 These two lovers found their way together 11 years ago when they attended the same college (thanks West Virginia Tech!)! 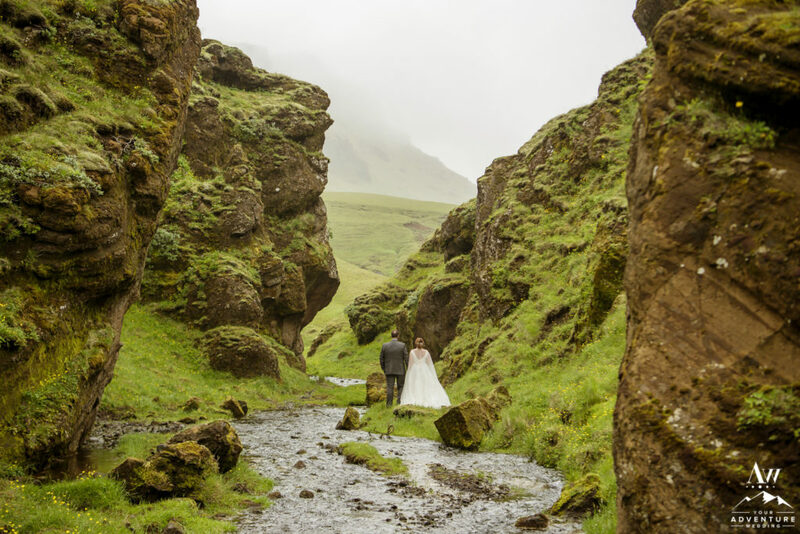 Living in 2 different states, they would often travel somewhere to meet up, explore nature, and learn more about each other. 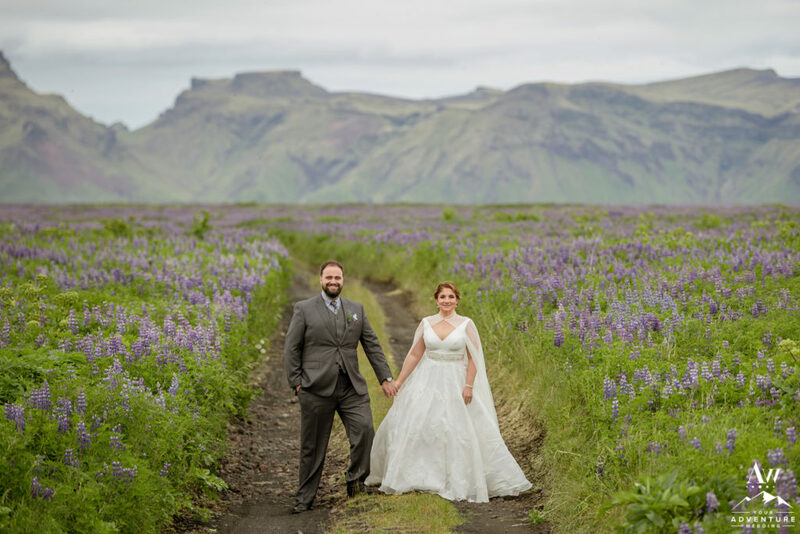 So planning an organic adventure wedding at Frost and Fire Guesthouse in Iceland was an easy decision! 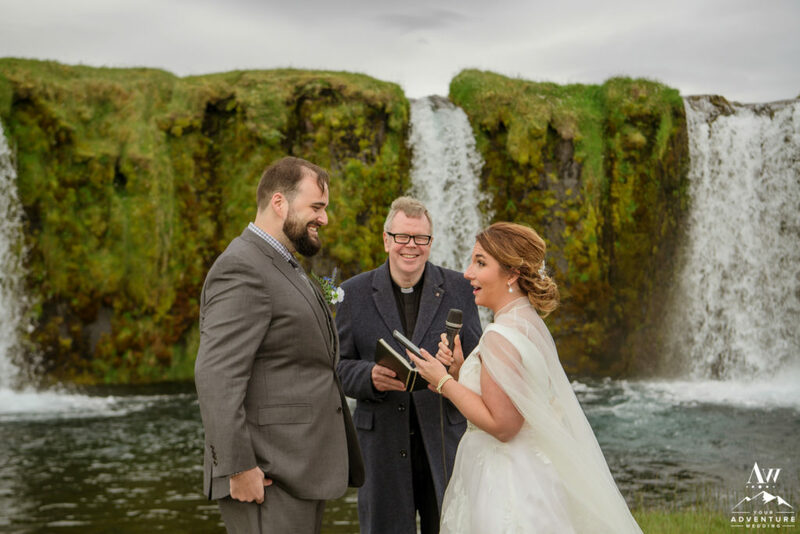 Three and a half months into their dating escapades, Brandi and Zach traveled to Iceland together as their first “weekend away” trip together. 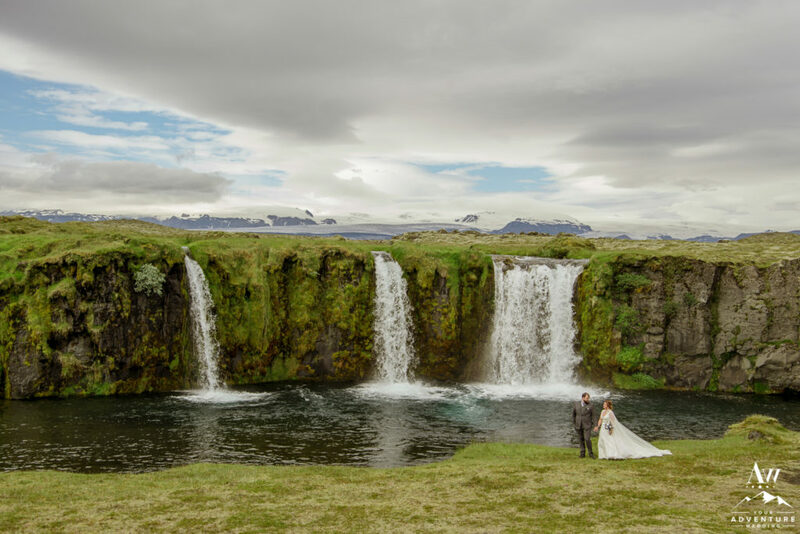 Pretty freaking awesome location to start travelling together, eh? 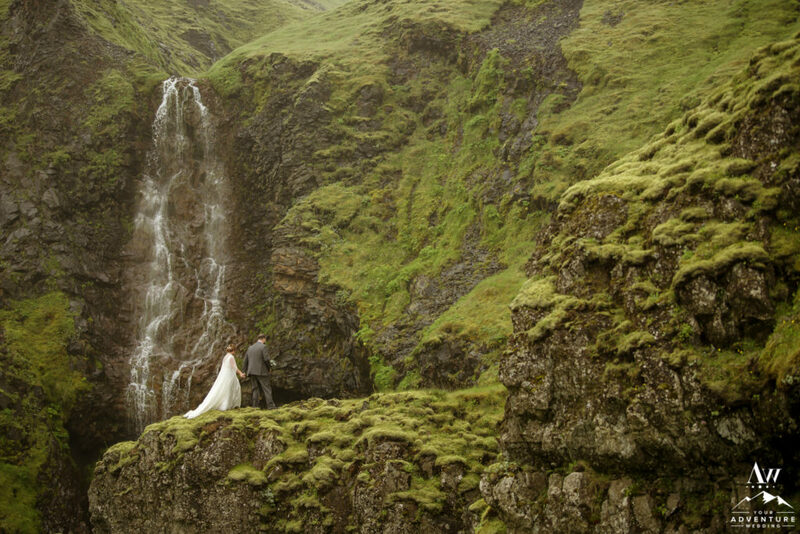 They not only fell in love with the dynamic landscape, but in love with each other! 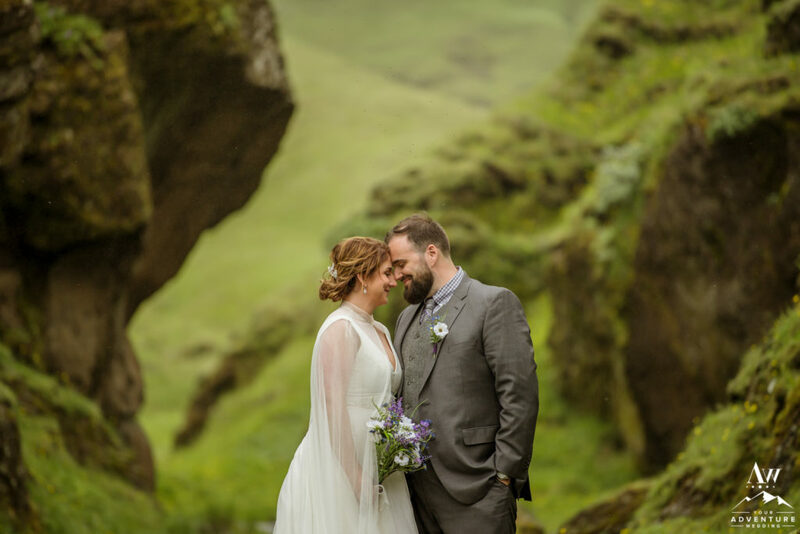 By the end of their adventure they were both convinced they had Viking blood running through their veins and this land was once “home” to them either in another life or via their ancestors. 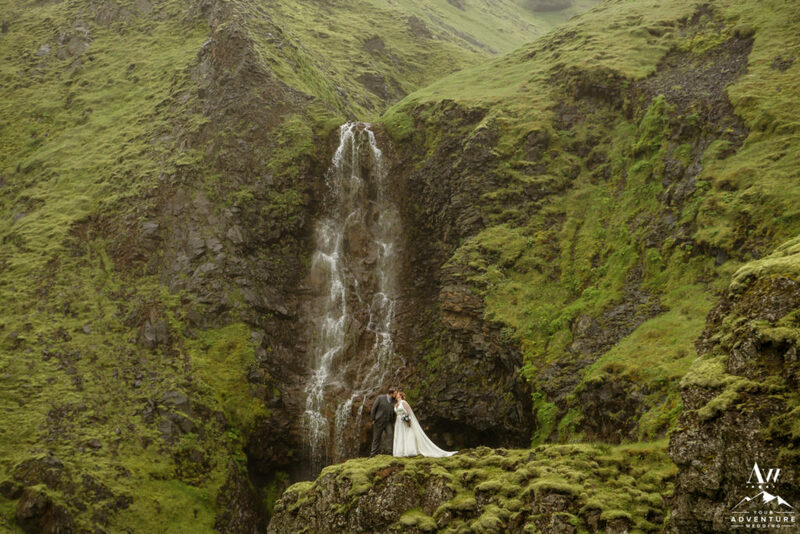 Either way, they were enamored and slightly obsessed with the countryside. 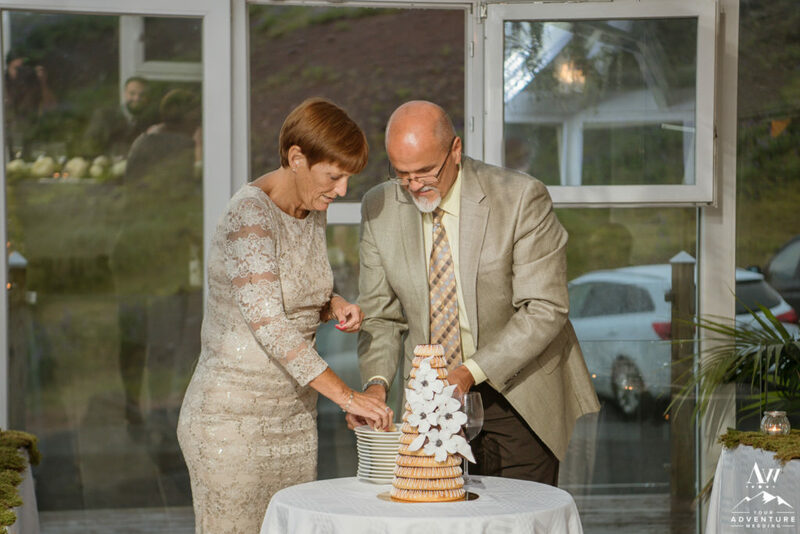 They are a couple who are always moving, learning, creating, and exploring. 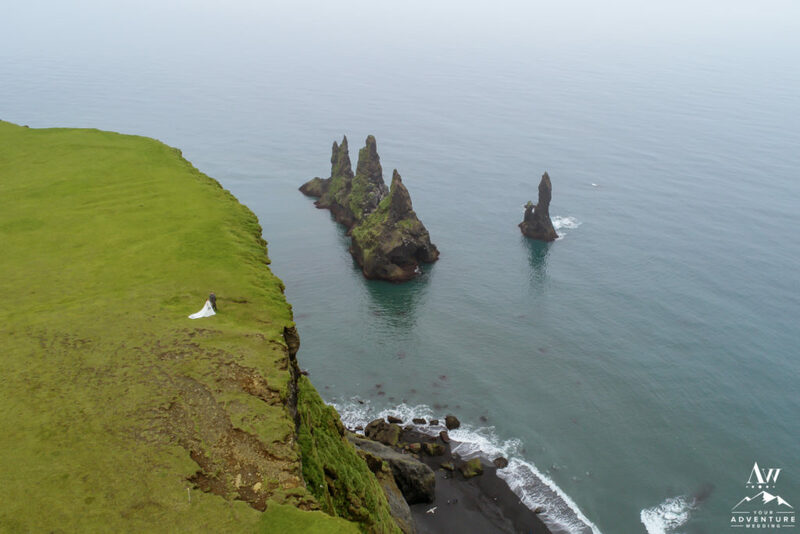 Brandi and Zach seek out unique food experiences, museums, local culture, and find their way to UNESCO World Heritage sites. 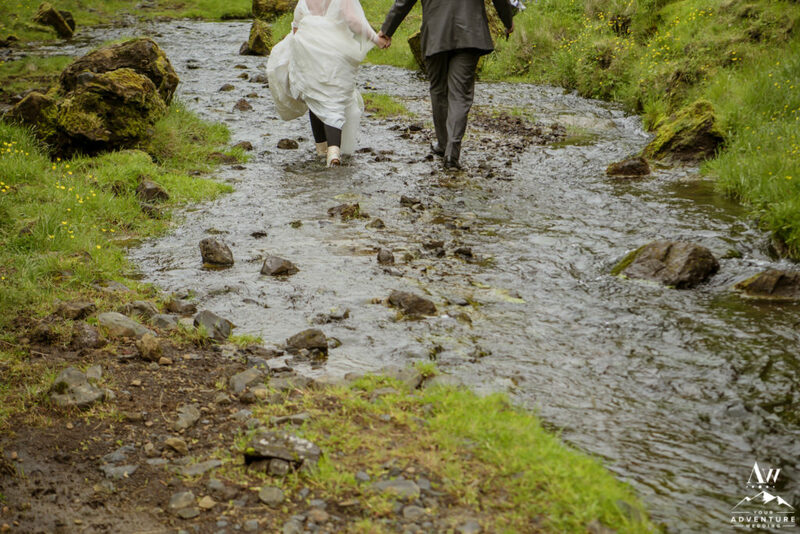 They share these passions which in turn makes a very firm foundation for their friendship and a lifetime of love. 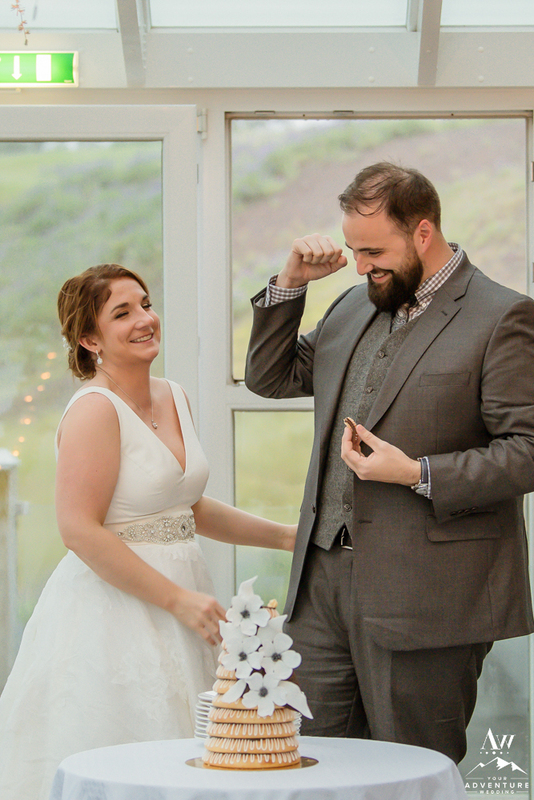 Speaking of lifetime love, let’s talk about the super sweet proposal that came after a few years of adventuring together… Brandi and Zach were on a road trip to Long Island. 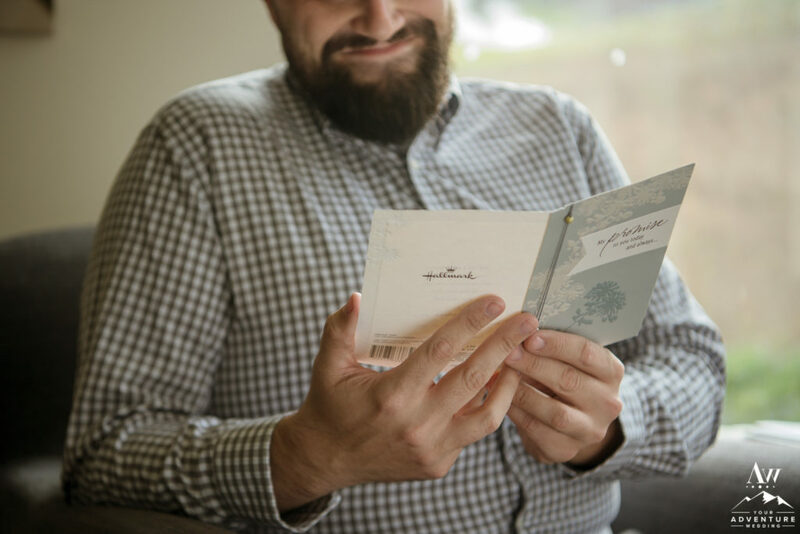 One of Zach’s personal passions is to write and read, so they paid a visit to a 180 year old library. 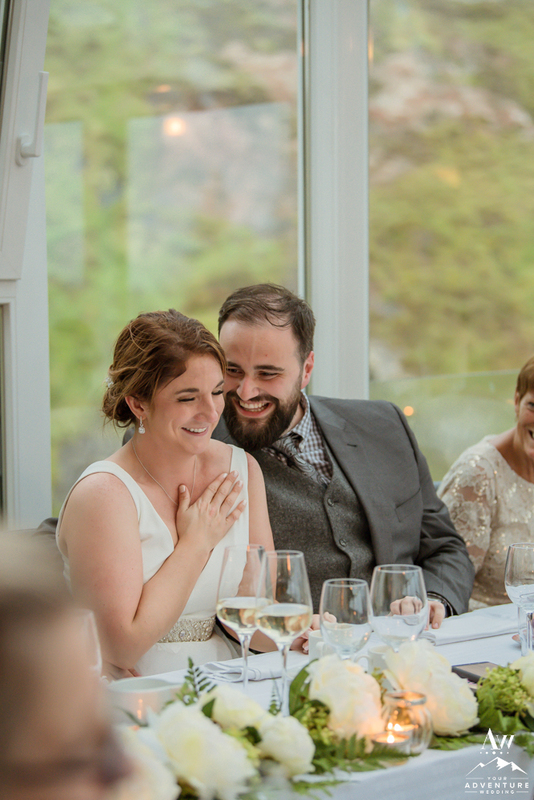 This was also the amazing location of where Edgar Allen Poe proposed to his beloved. 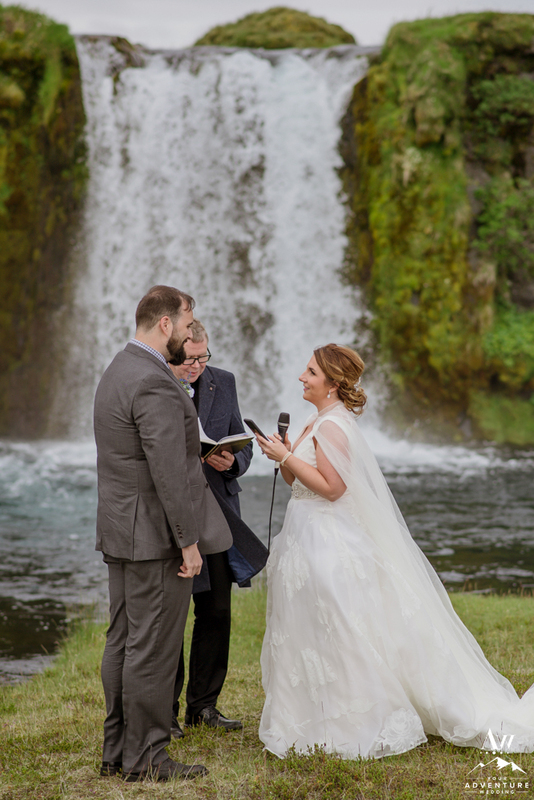 Zach had presented Brandi with an incredible book he had written about their love story (hello 155 pages of adoration) and proposed at the end of it! 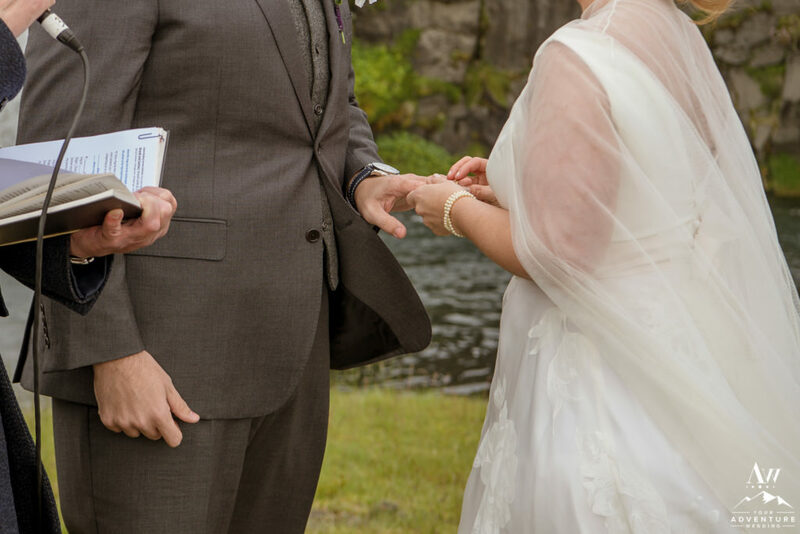 Serious high five, Zach!! 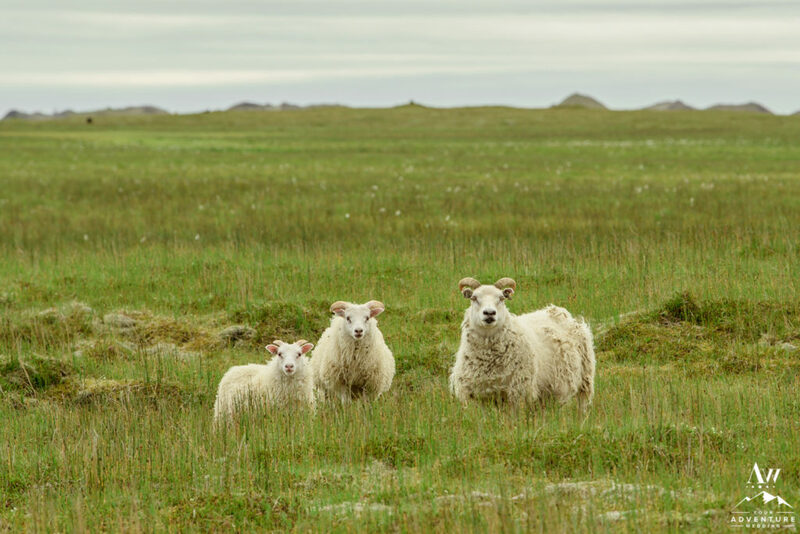 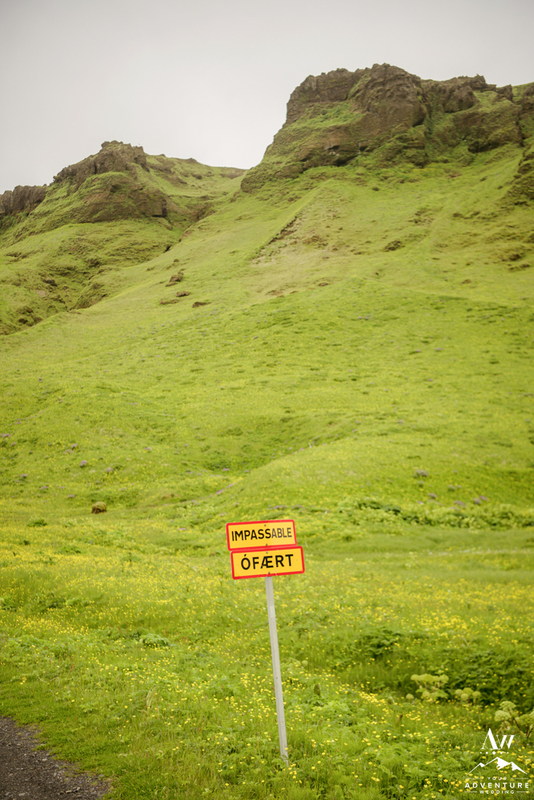 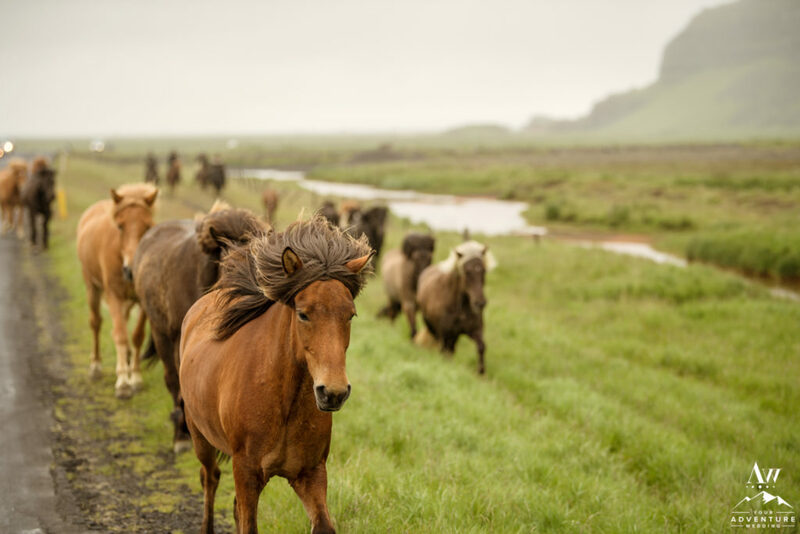 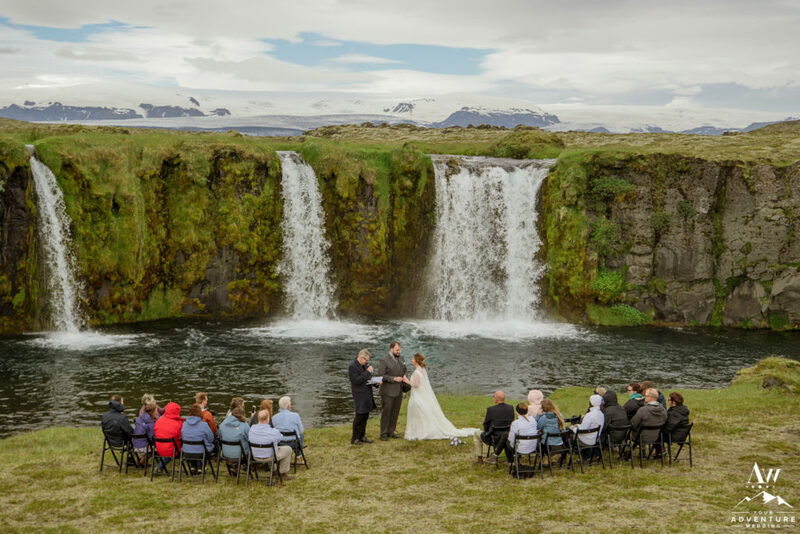 When it came to destination wedding planning, Iceland was the only location they found serious excitement over. 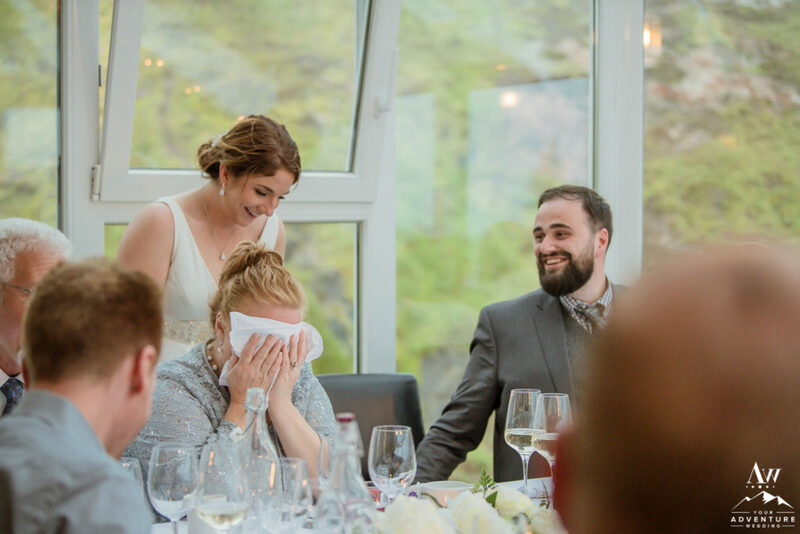 Sharing with their friends and family the country they fell in love was a perfect way to celebrate their marriage. 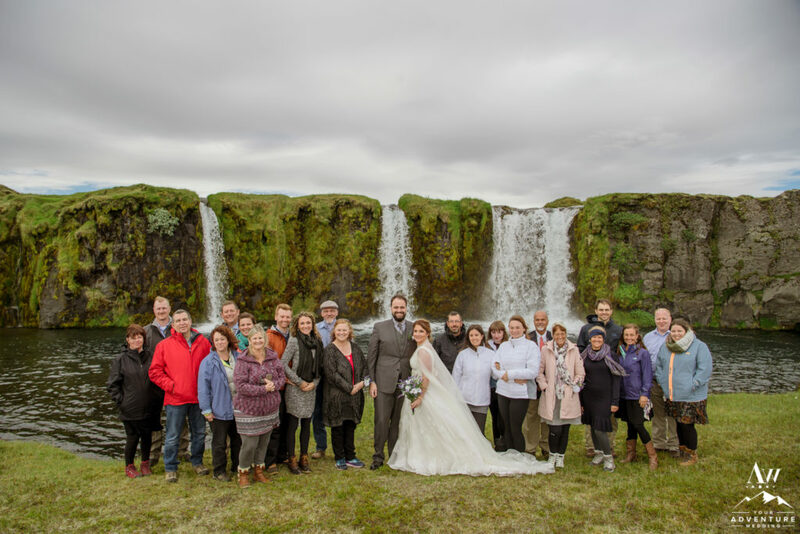 Not big fans of tradition, they wanted to plan a wedding in Iceland that was private, exclusive, and just them and their guests with a sense of adventure sprinkled in. 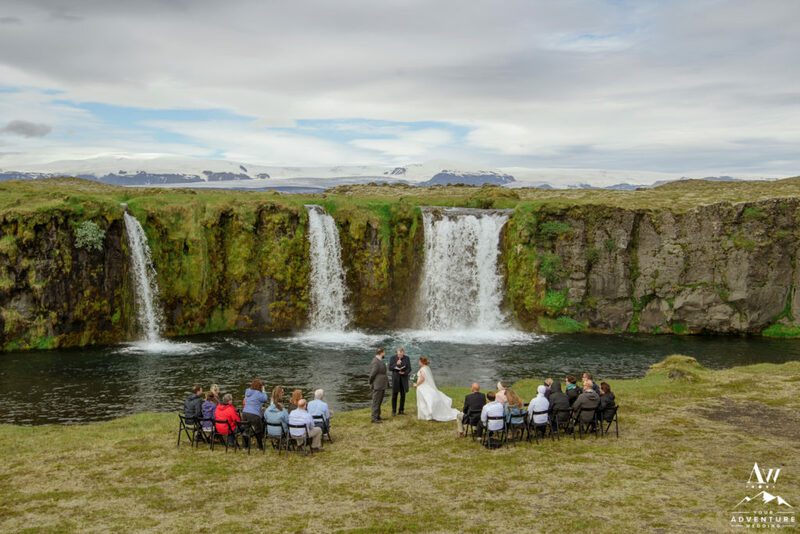 Finding our Iceland Wedding Planner team and learning about us, encompassed exactly the sort of privacy and adventure they wished for! 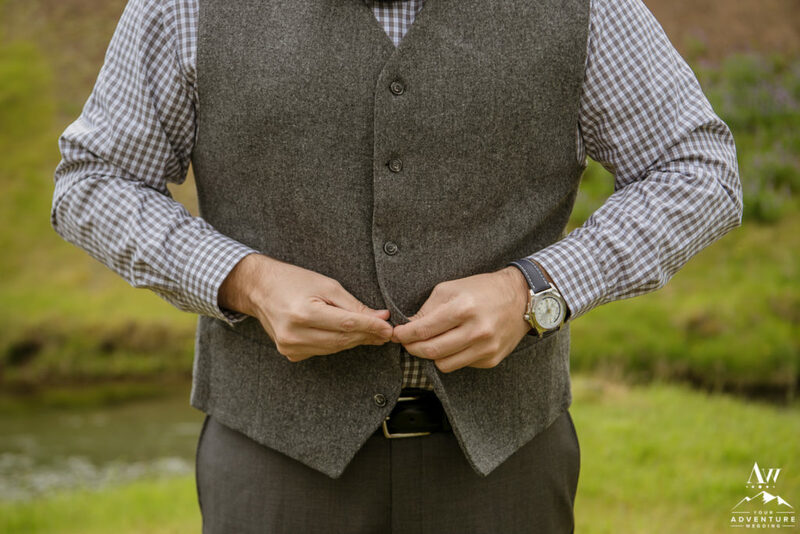 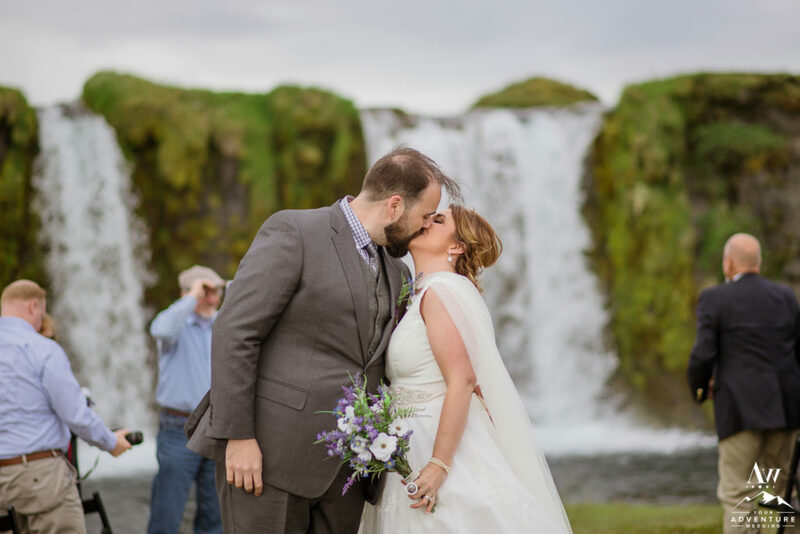 Planning an Iceland adventure wedding with them was so much fun for the 1.5 year we worked with them! 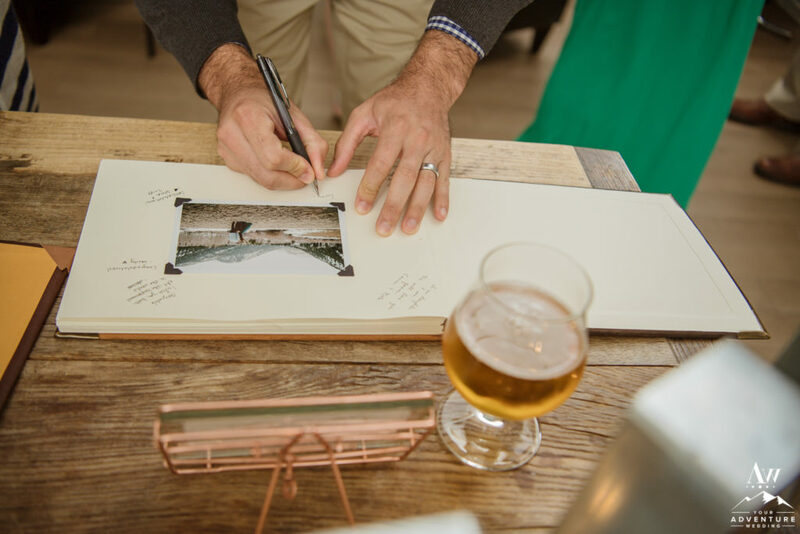 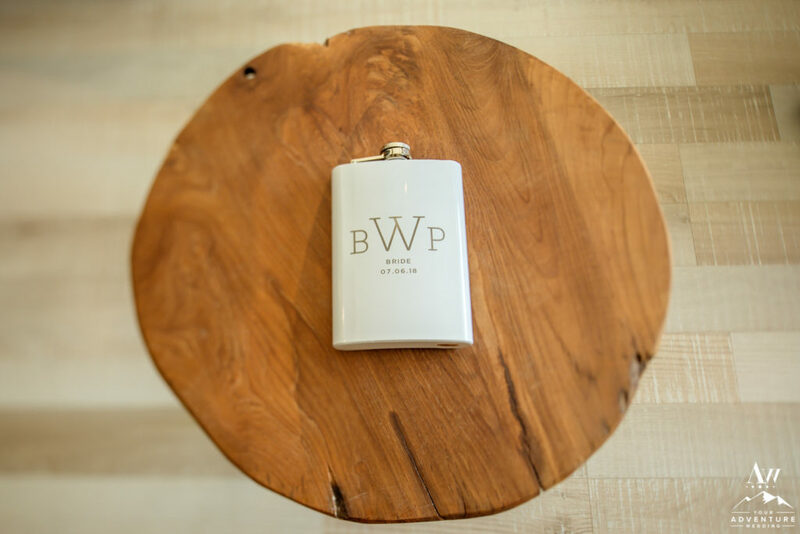 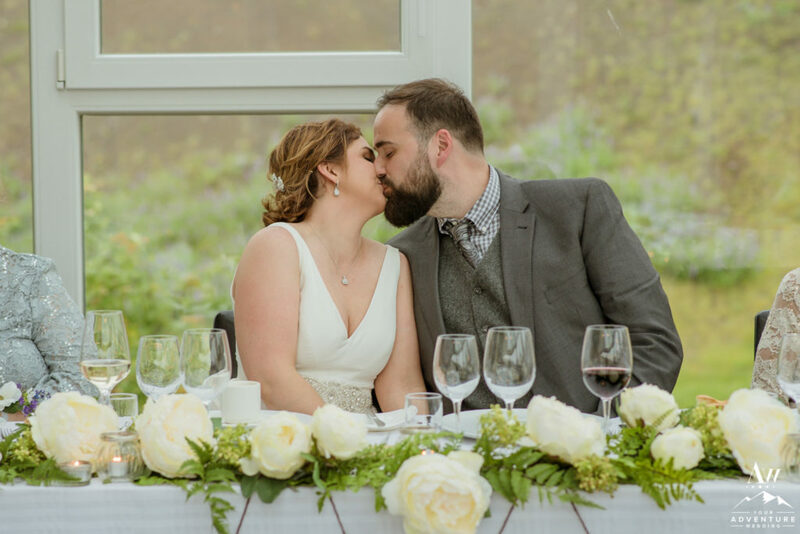 Brandi and Zach embraced the variety of dynamic landscapes and desired for a very organic vibe throughout the adventure wedding day and the reception. 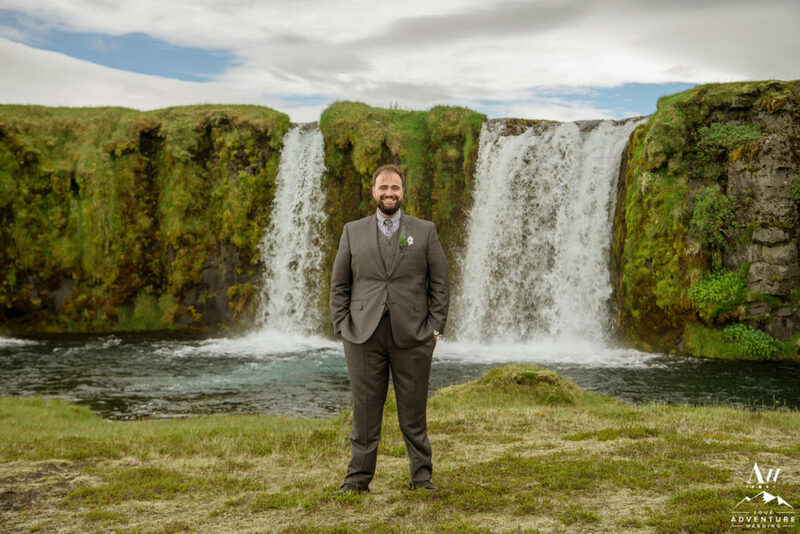 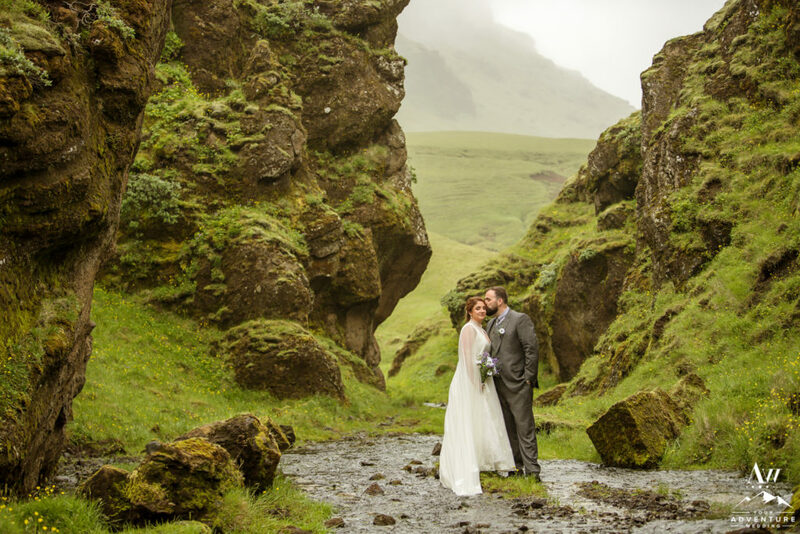 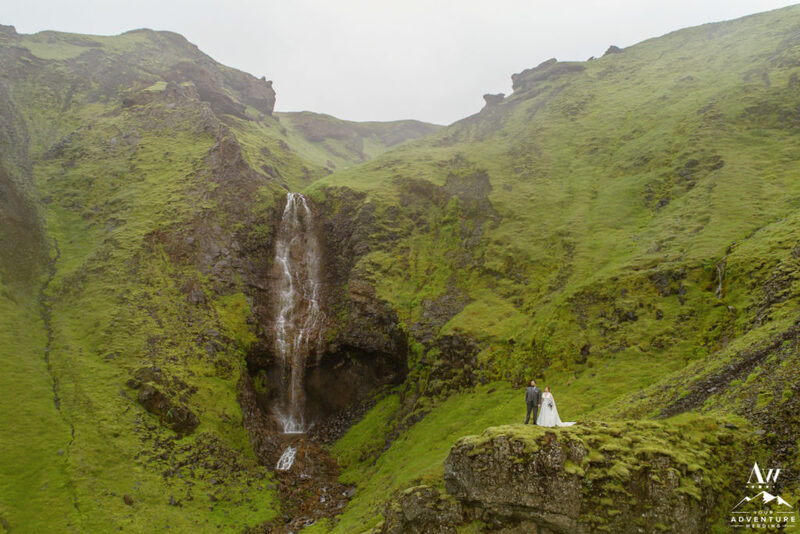 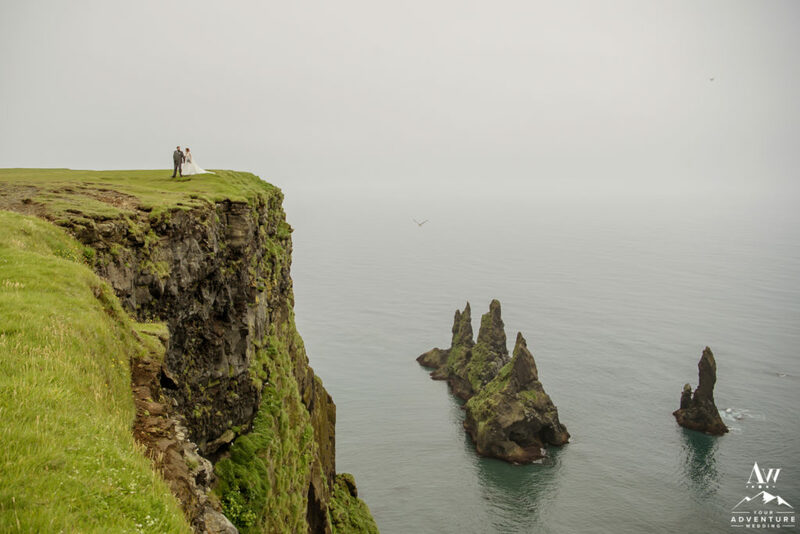 Most of their wedding in Iceland had them surrounded by super green colors and vibrant moss! 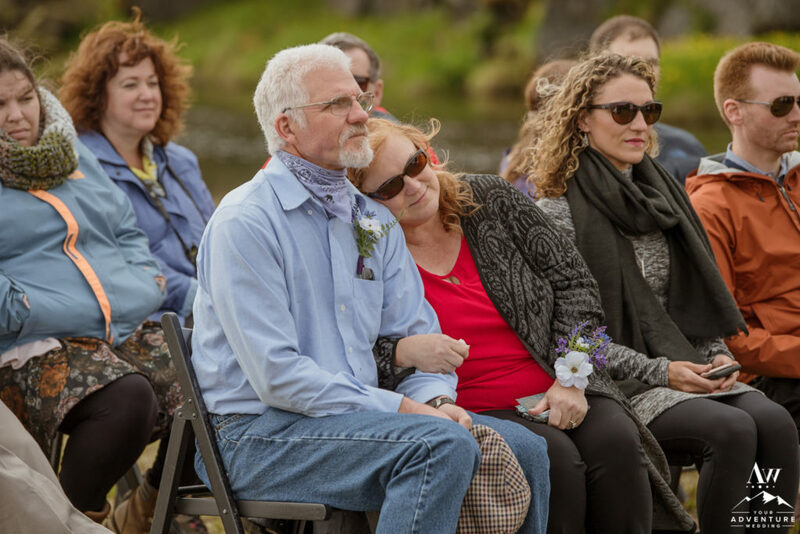 Love that vibe too? 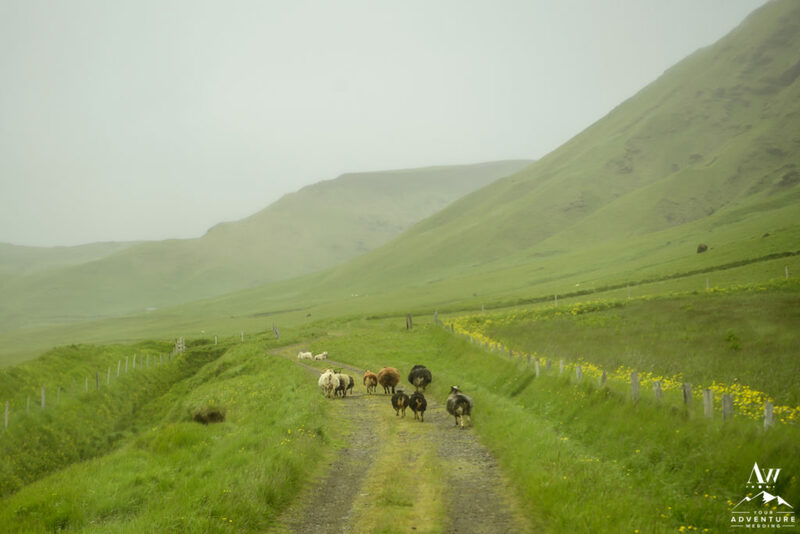 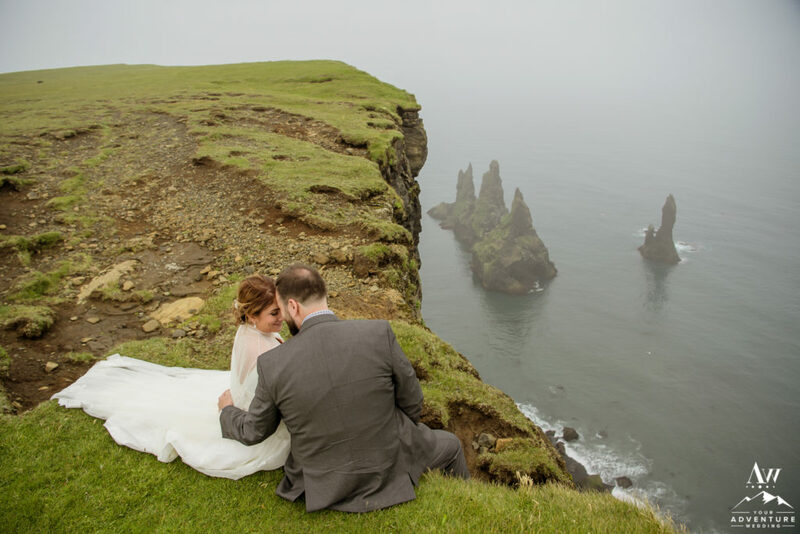 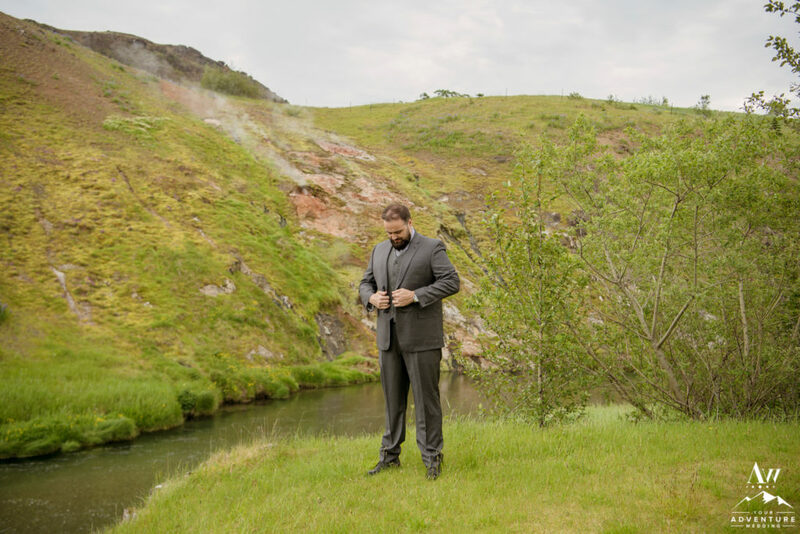 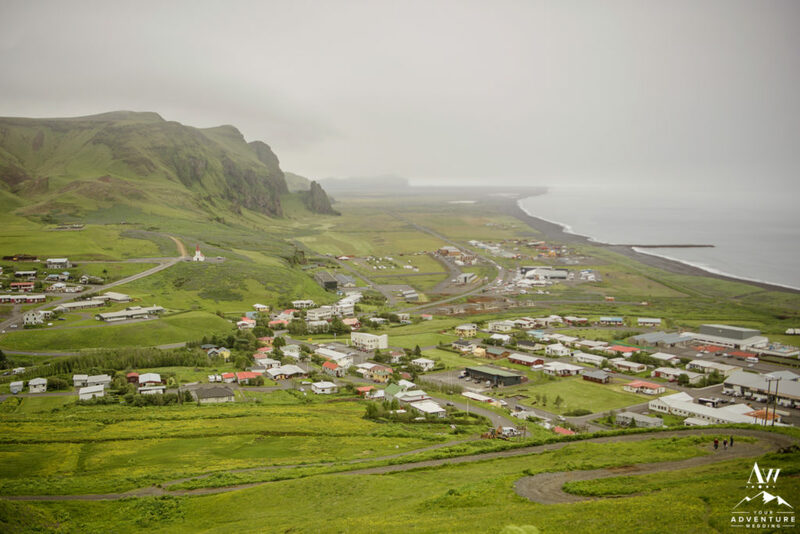 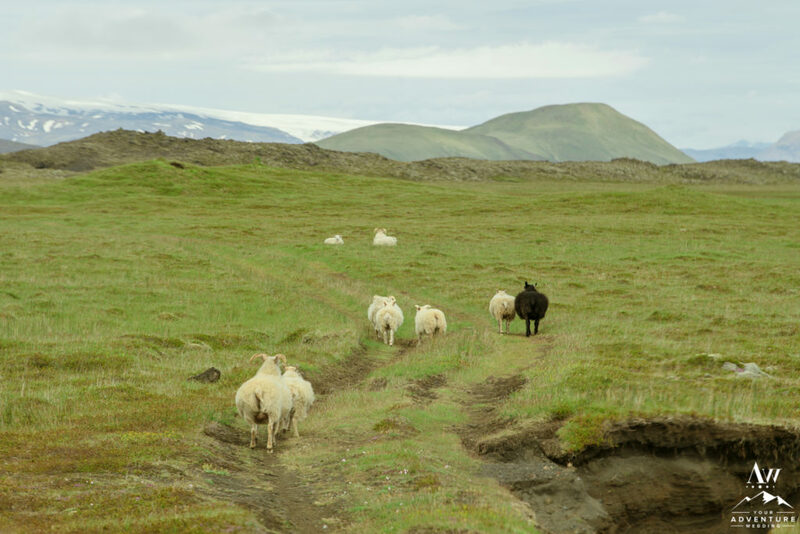 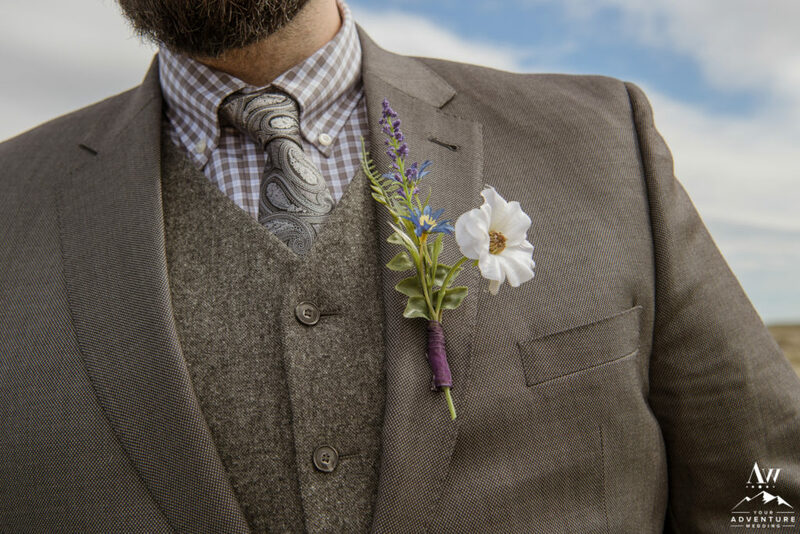 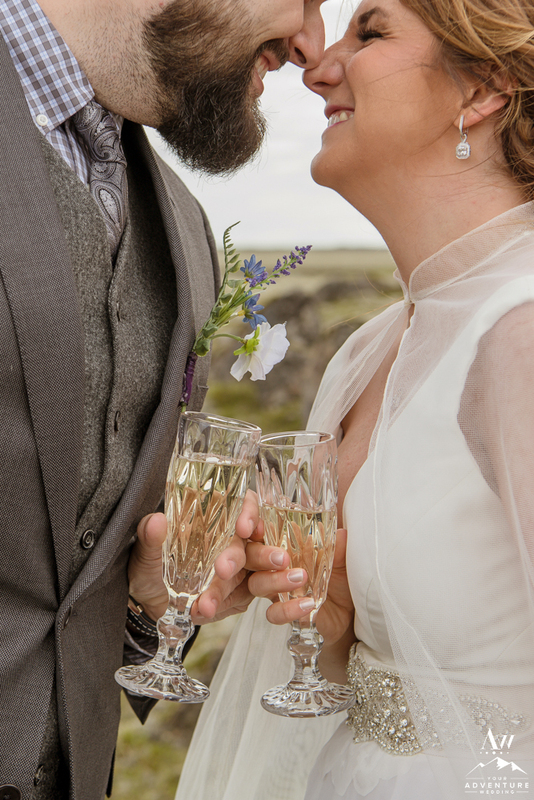 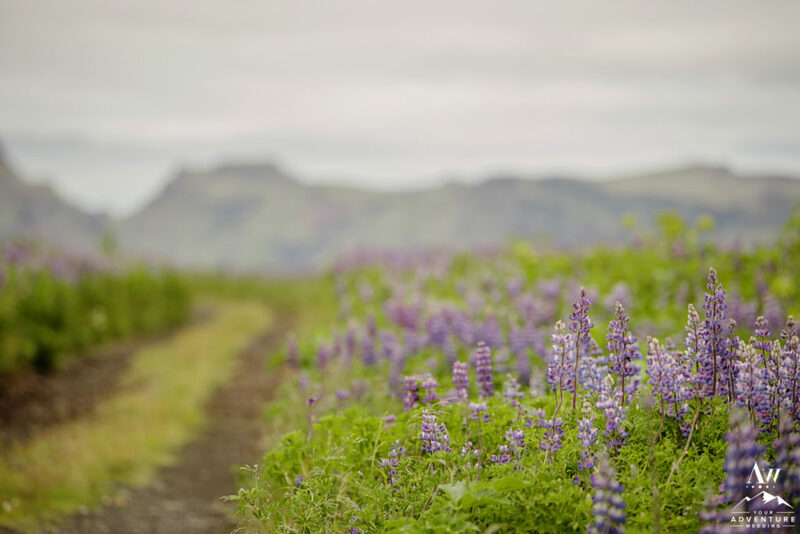 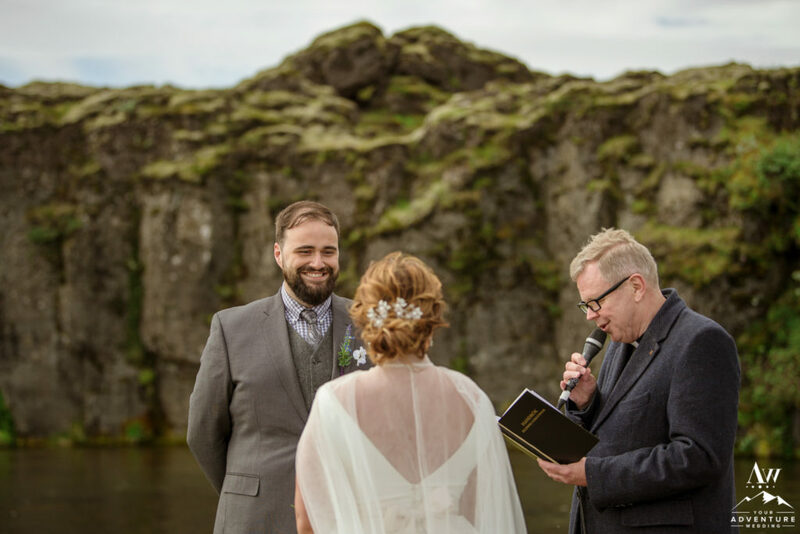 Read on to experience Brandi and Zach’s organic adventure wedding in Iceland! 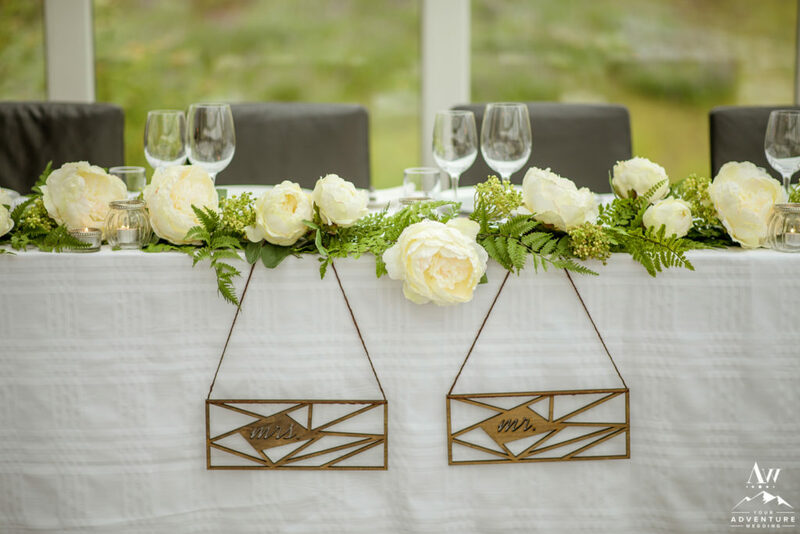 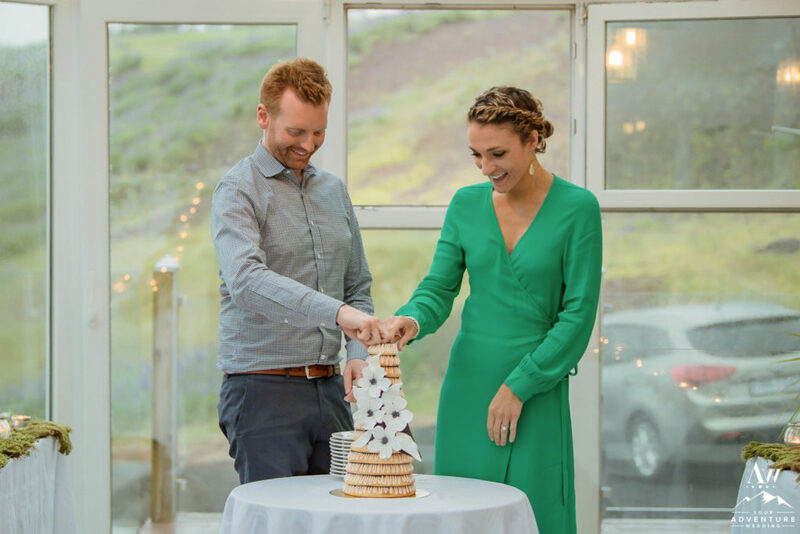 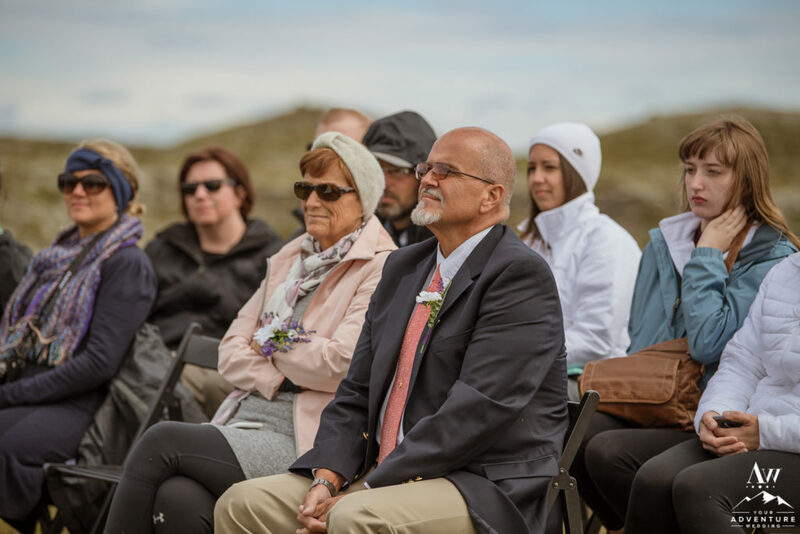 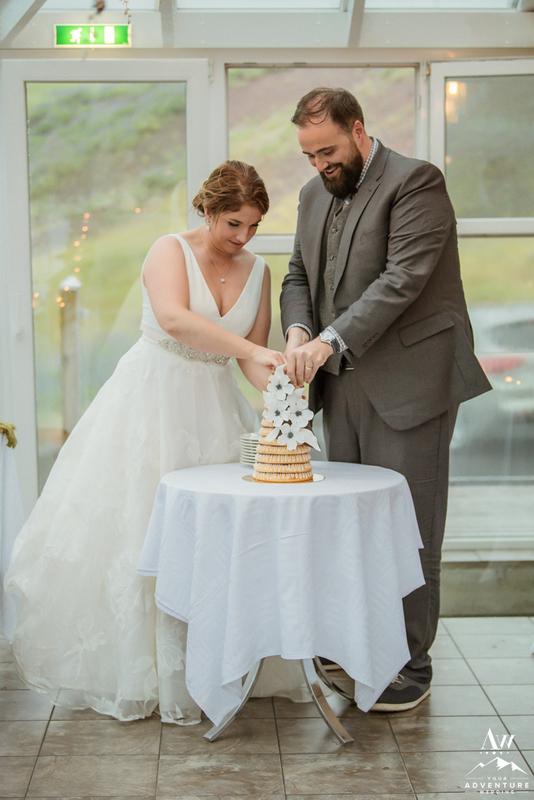 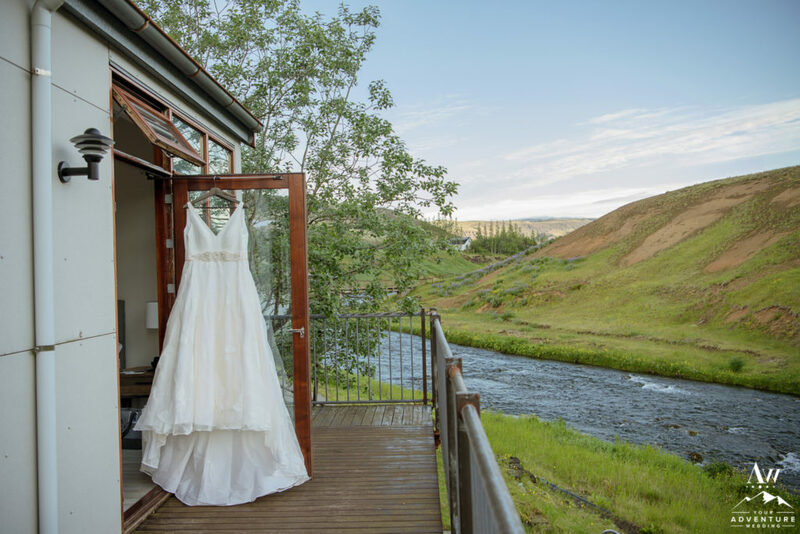 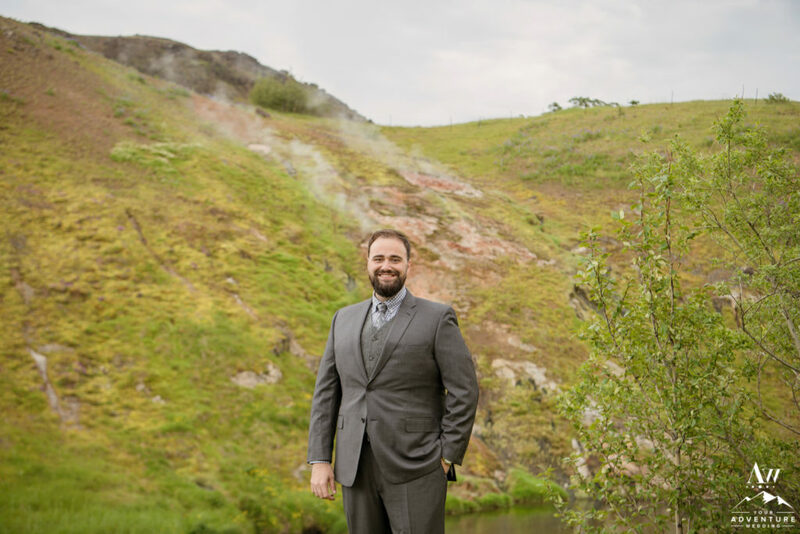 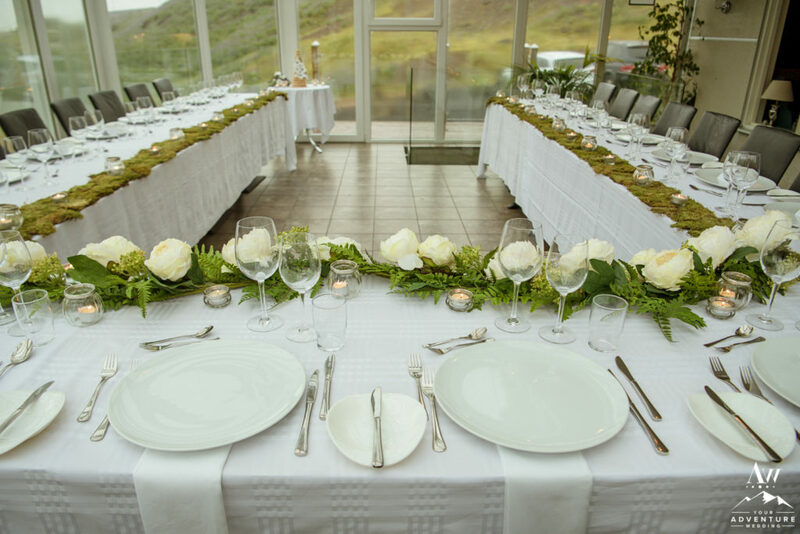 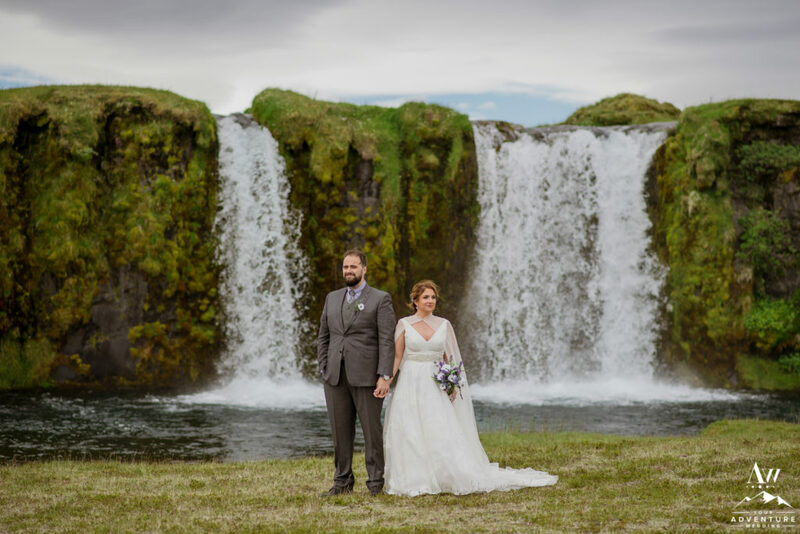 Brandi and Zach loved the idea of having all of their guests under one roof, a place which overflowed local charm, and boasted amazing views for their July 6th summer wedding in Iceland. 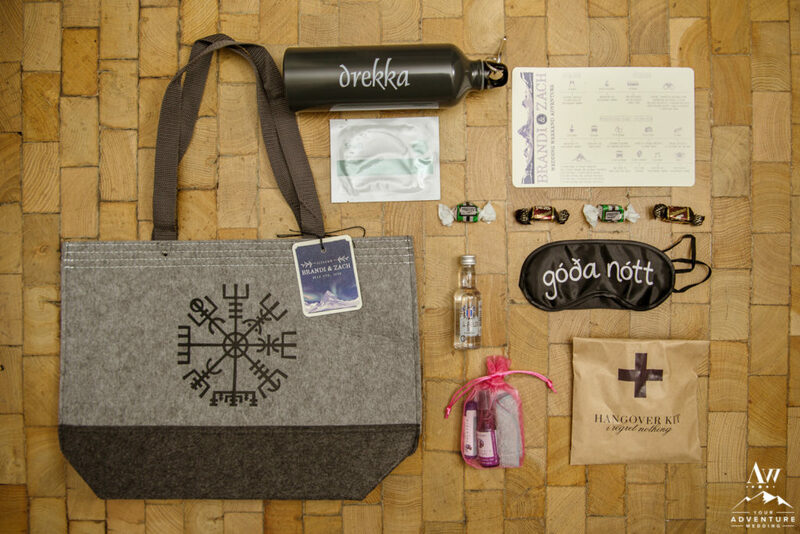 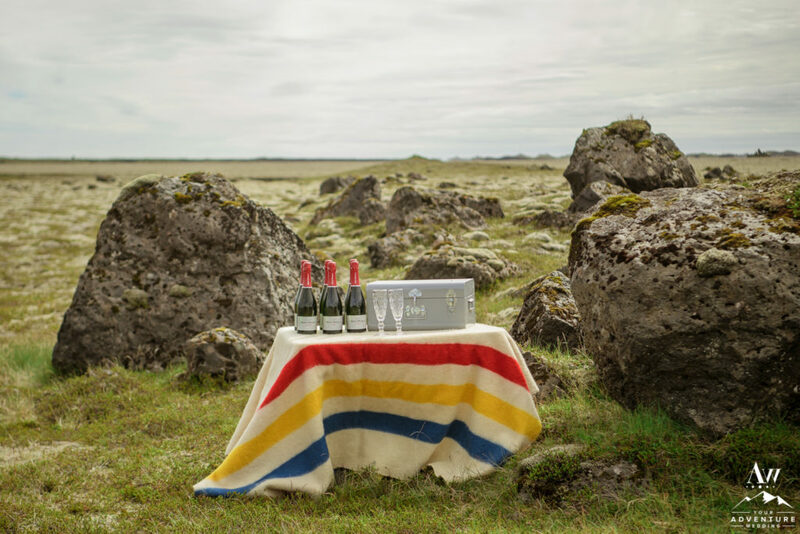 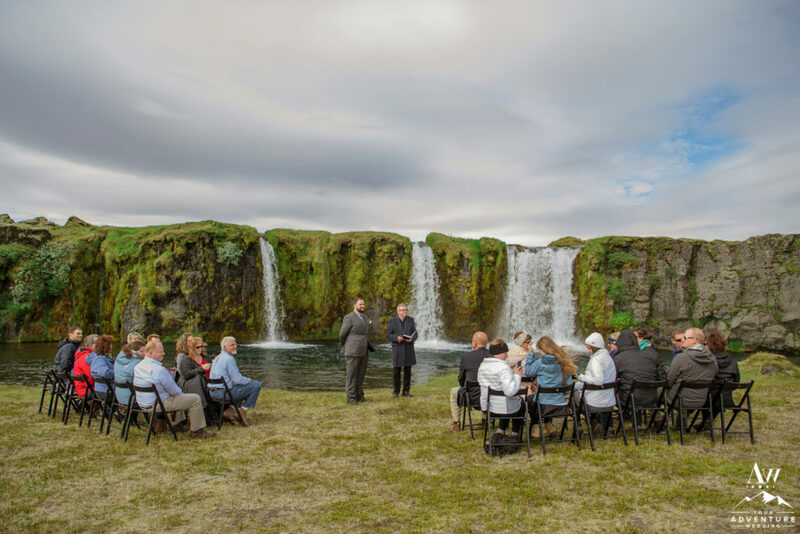 Our Iceland Wedding Planner team crafted a 2 day schedule for the group. 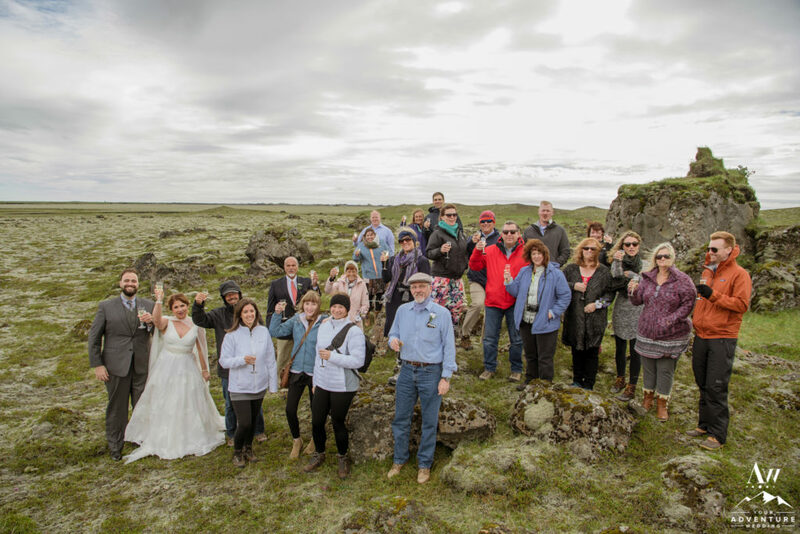 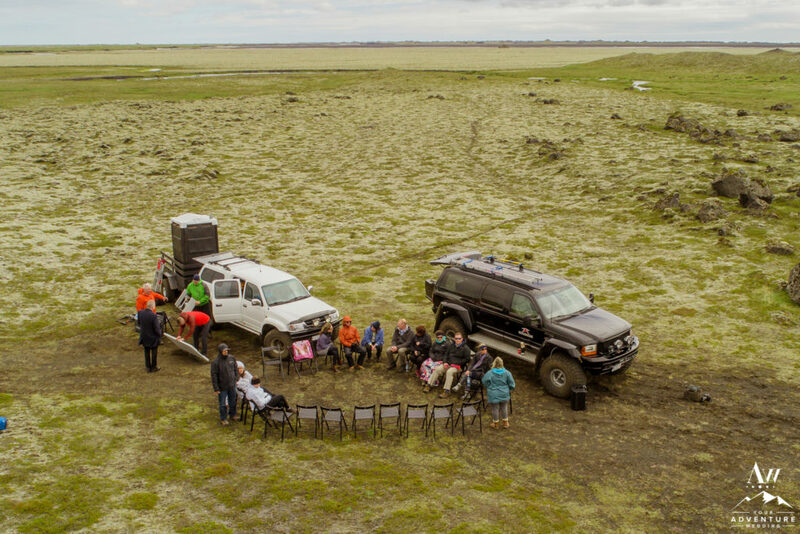 Day one was via bus to the famed “Golden Circle” area with some offbeat stops and day two was their adventure wedding via super jeep to private locations. 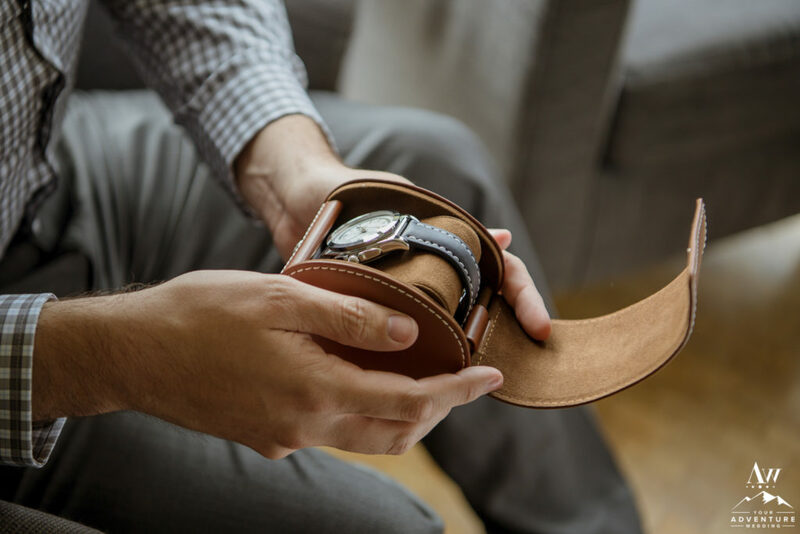 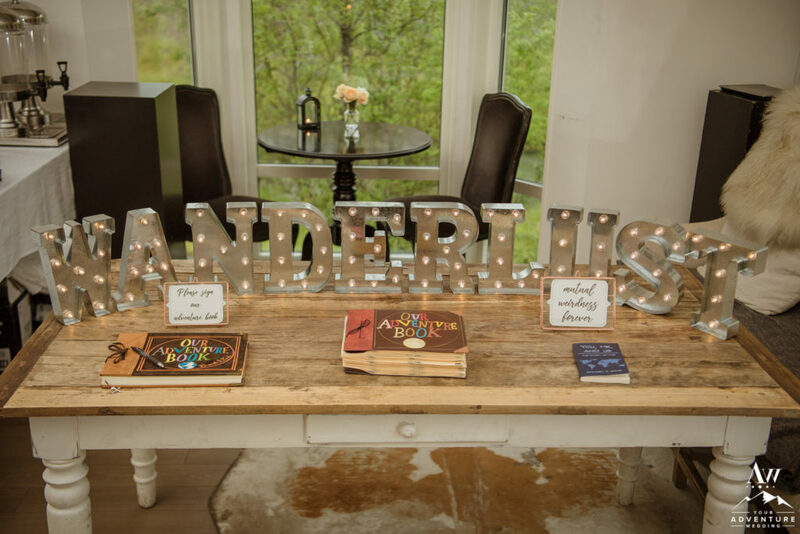 Doing both days meant they were literally gifting their guests with experiences they would never ever forget! 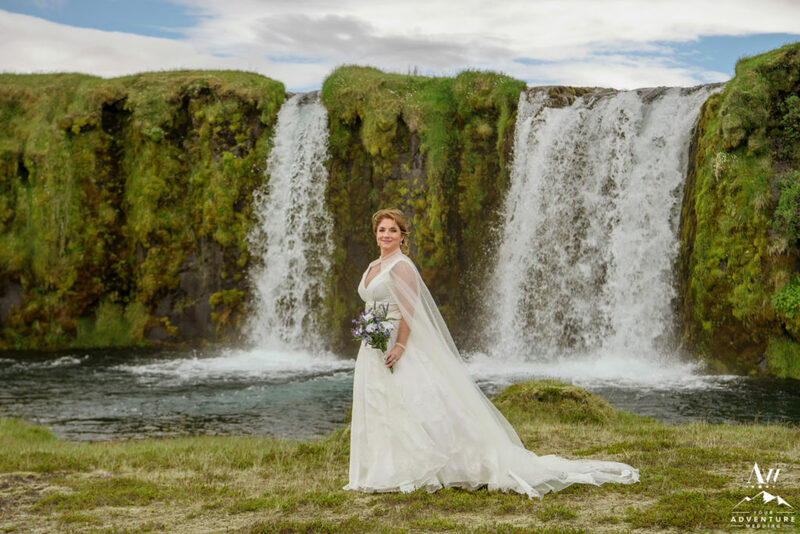 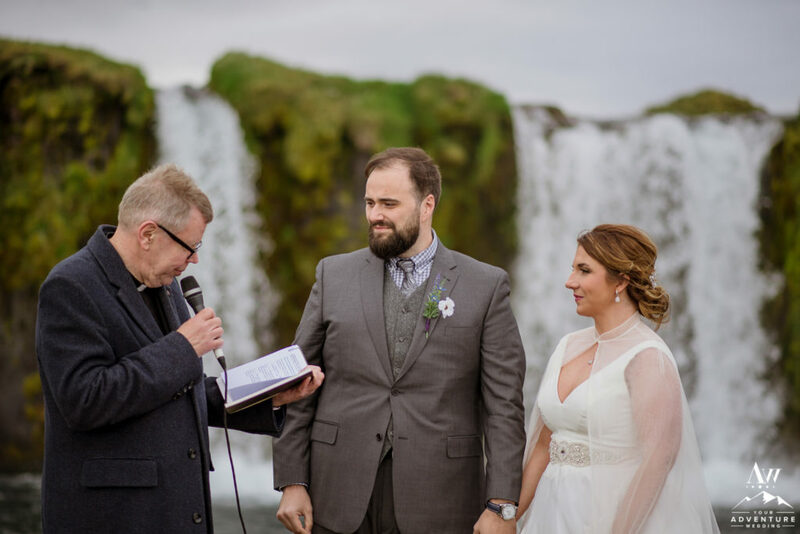 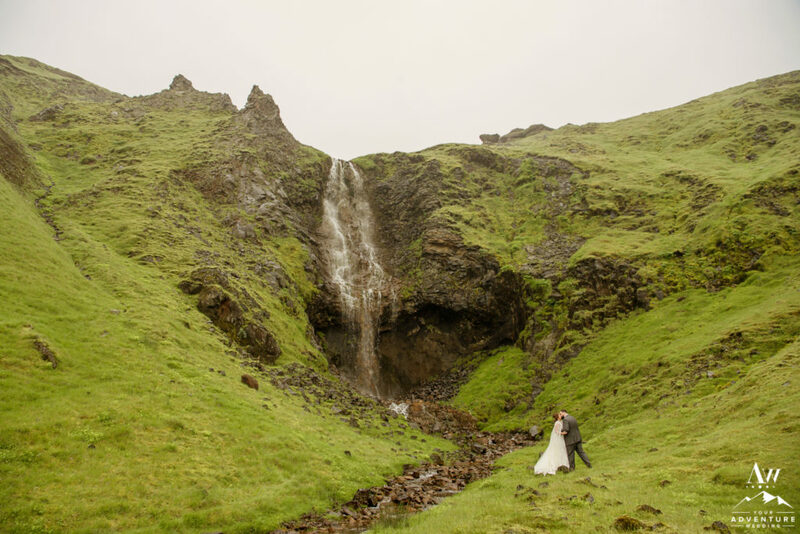 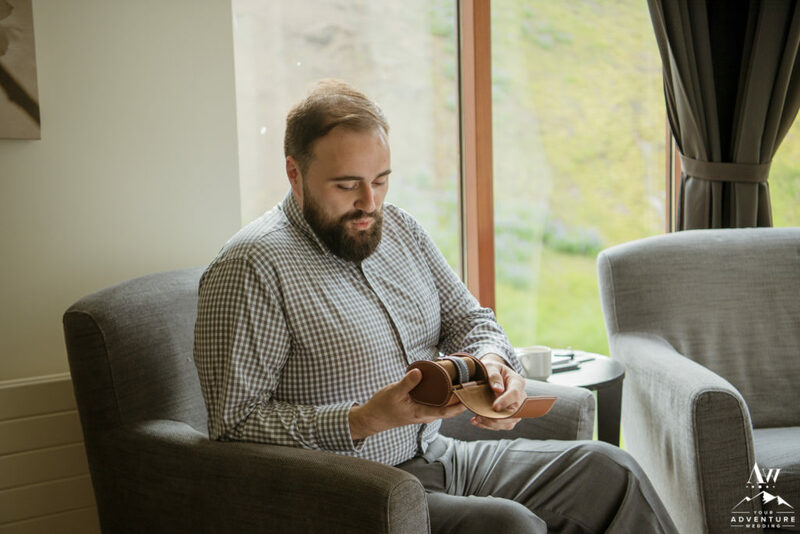 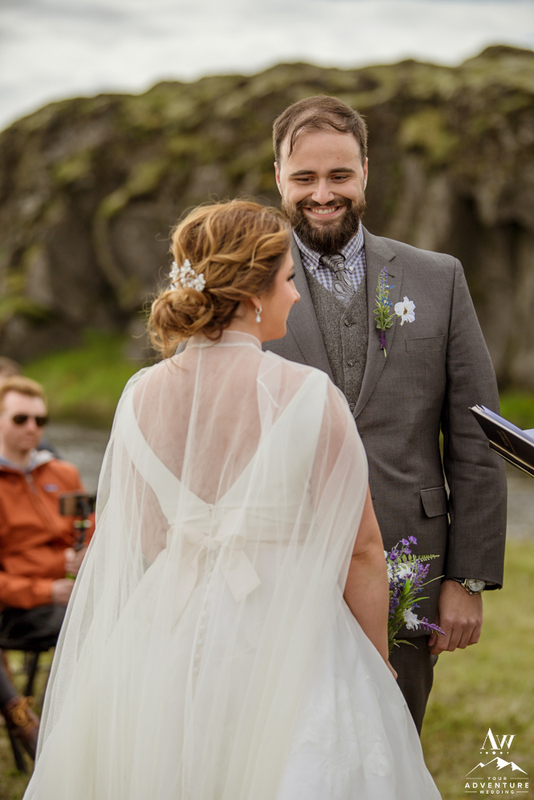 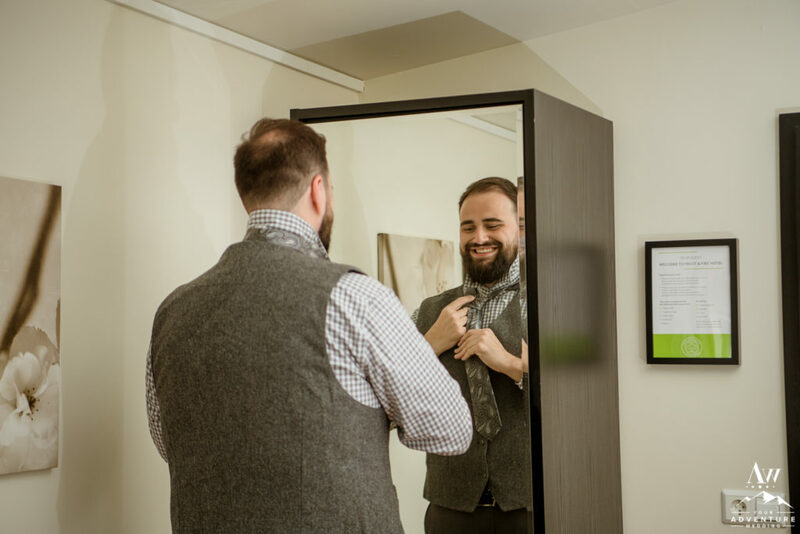 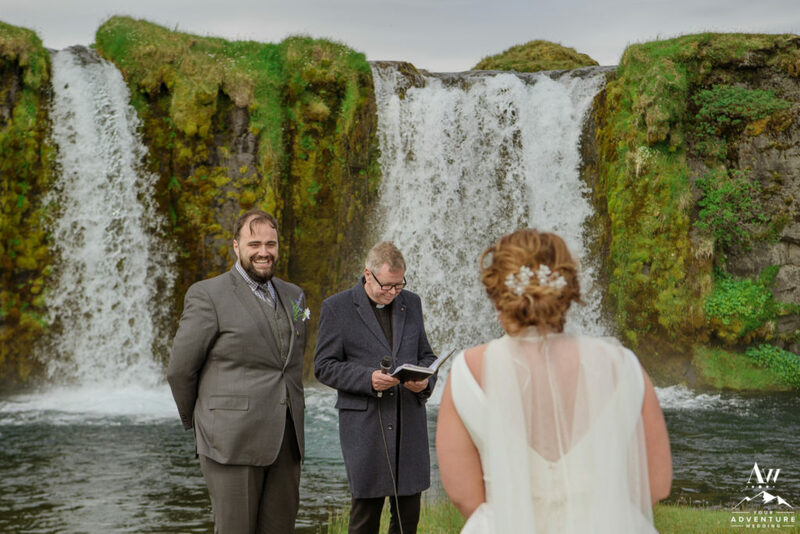 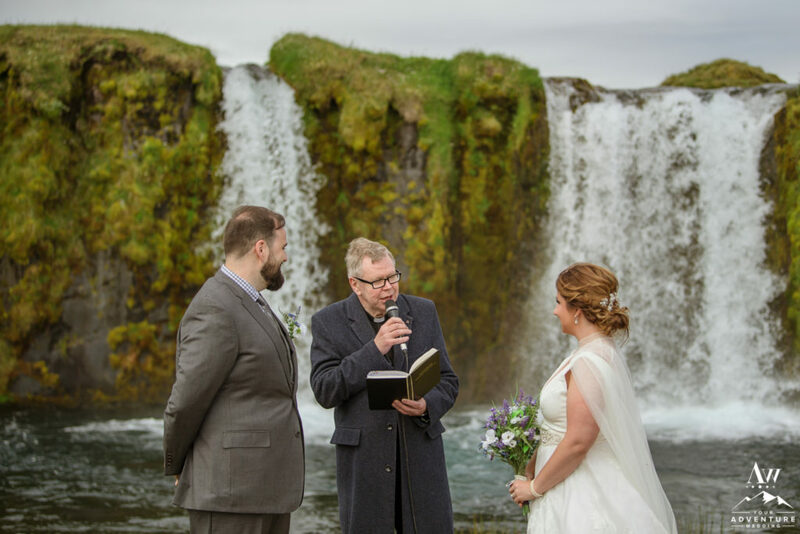 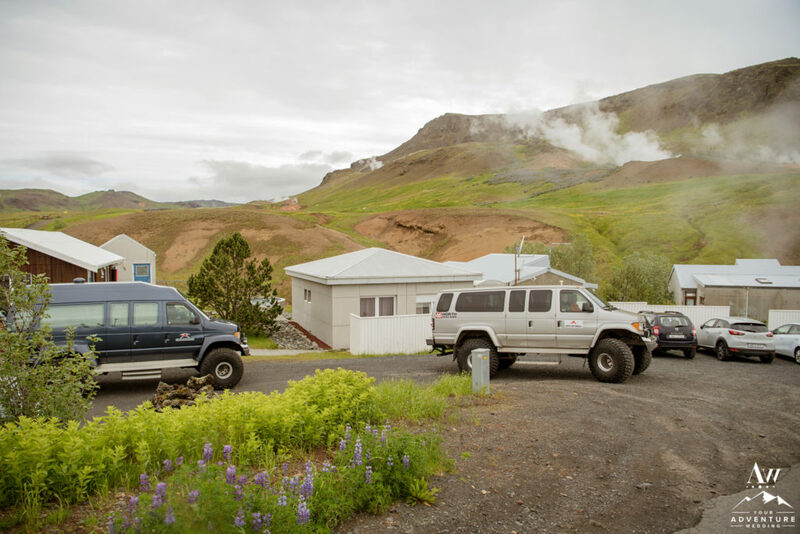 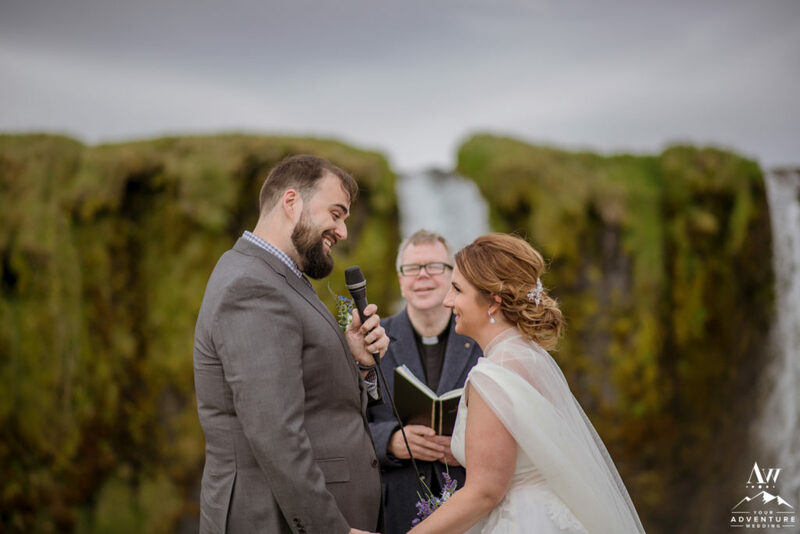 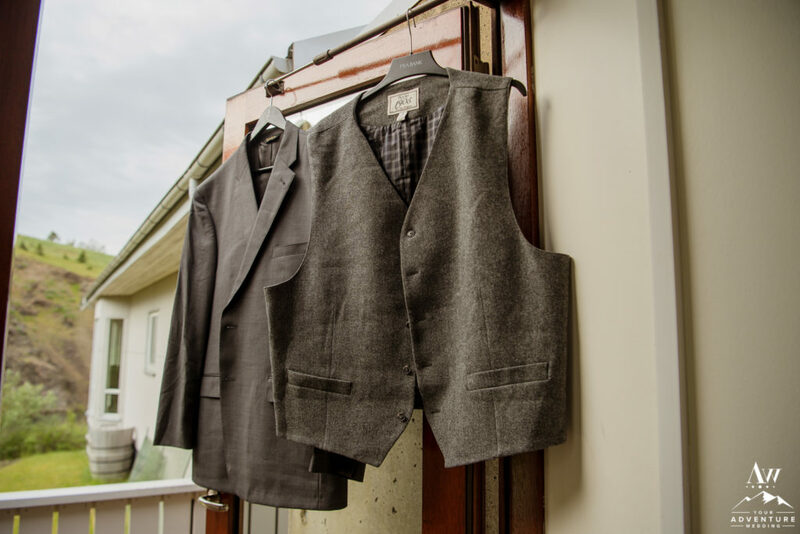 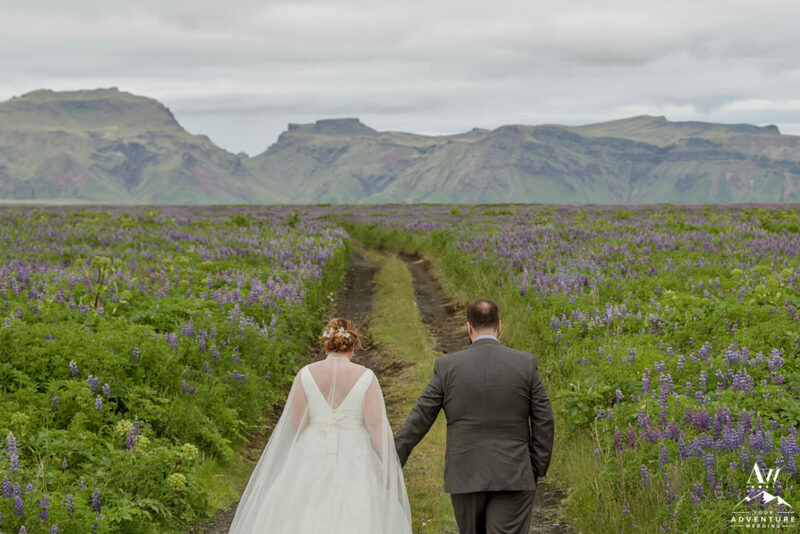 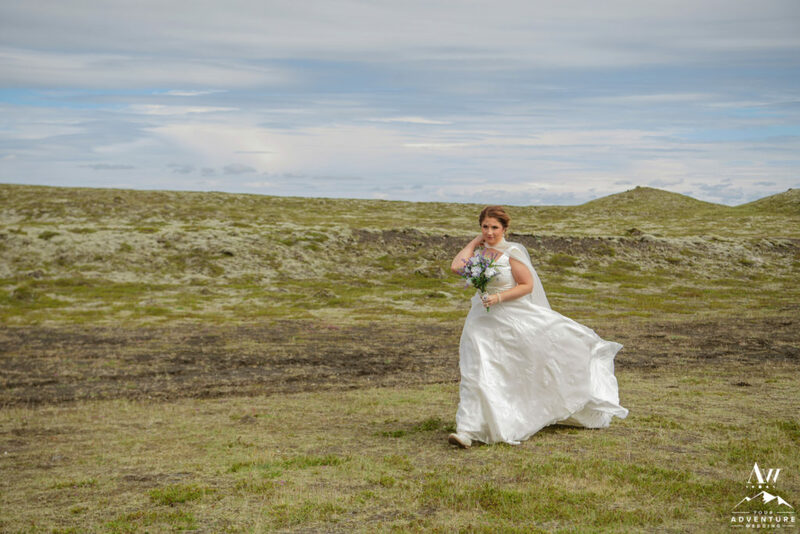 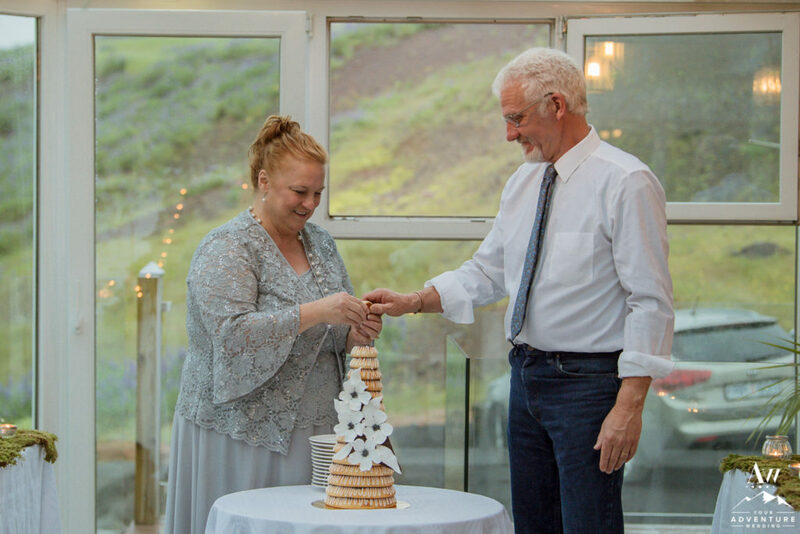 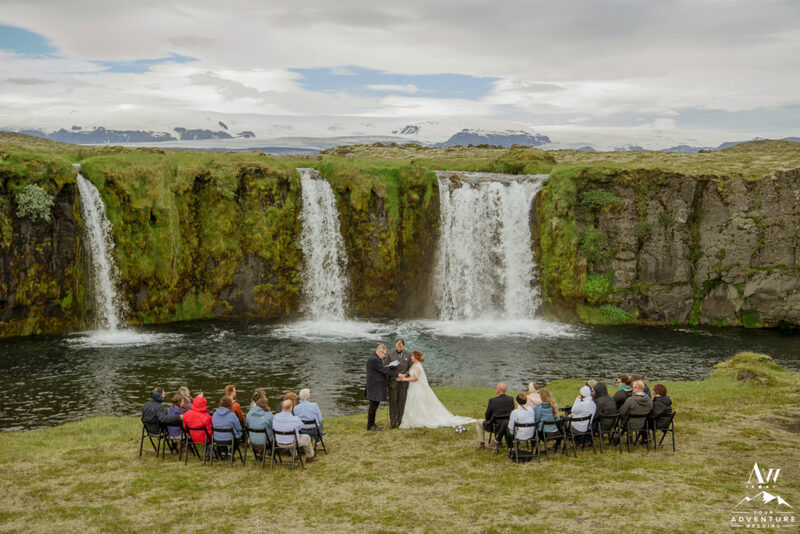 After reviewing our amazing wedding day options and paired hotels, Frost and Fire Guesthouse in Hveragerði turned out to be their perfect place for their Iceland wedding host hotel. 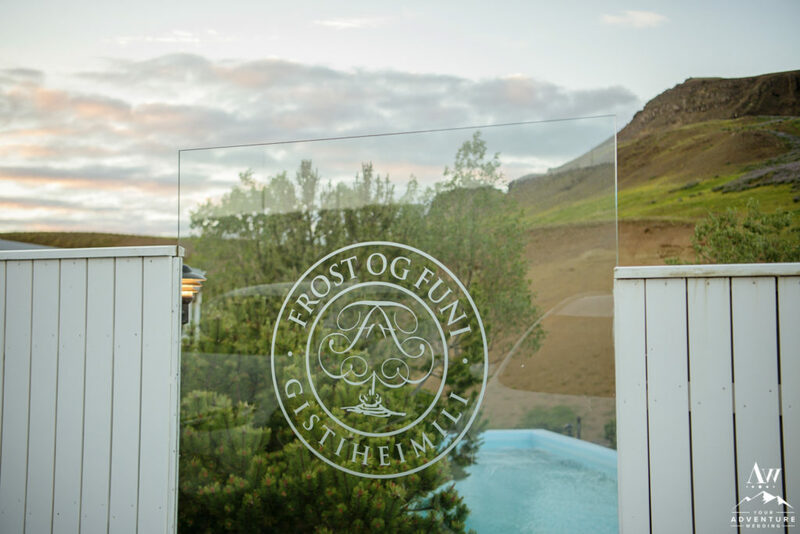 Have you seen Frost and Fire? 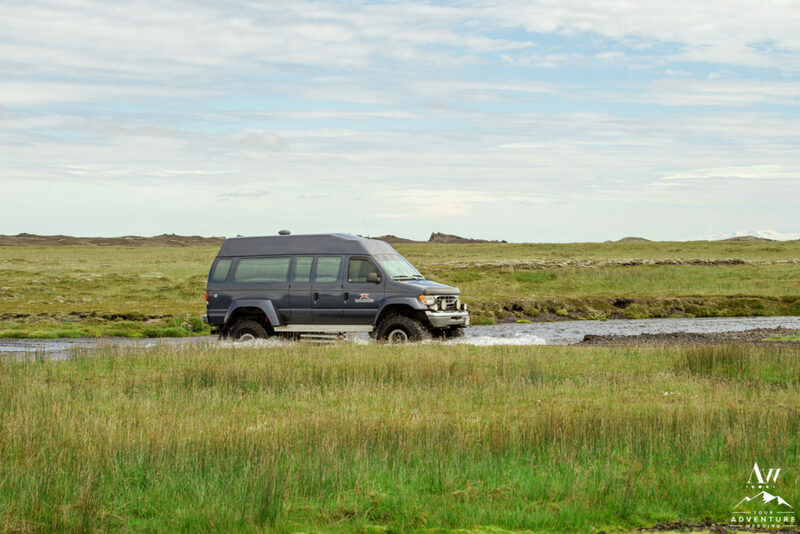 It’s a unique yet luxurious experience to have in Southern Iceland. 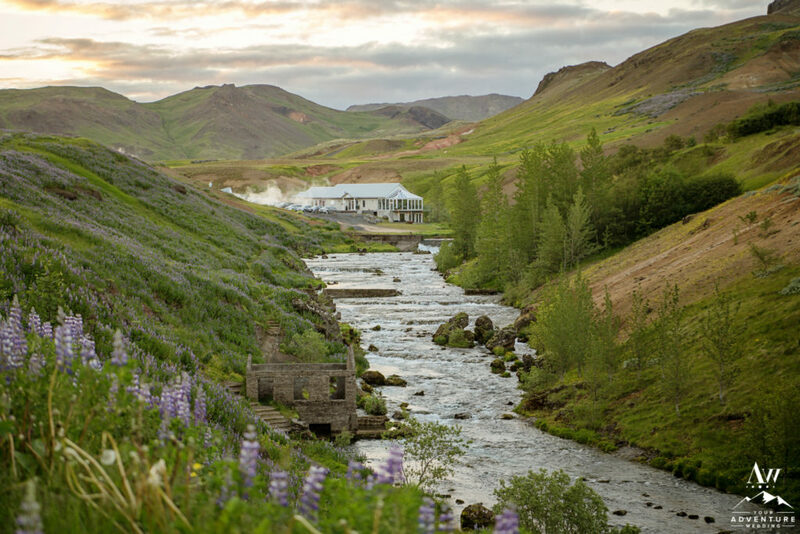 They have hands down one of the best outdoor pool, hot tubs with views, contrast therapy (cold water to hot to help with circulation), the most amazing countryside restaurant, Varma, and the only location you can boil your breakfast egg yourself in a hot pot inside the earth! 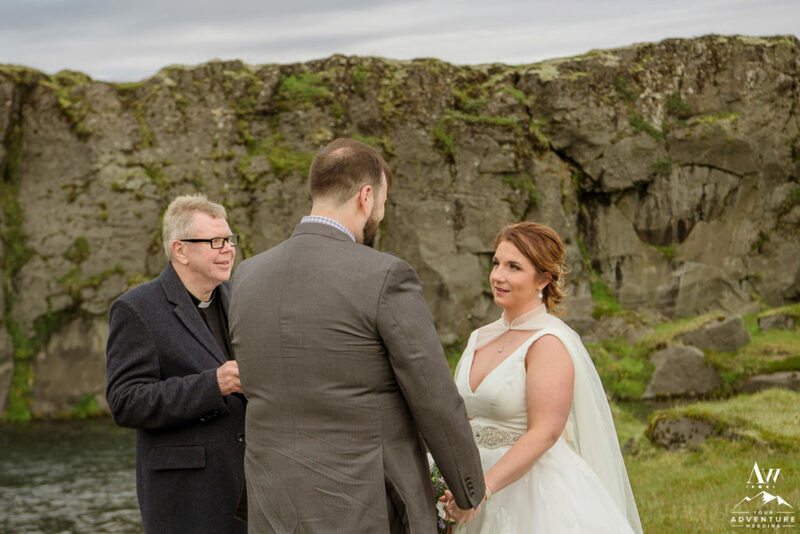 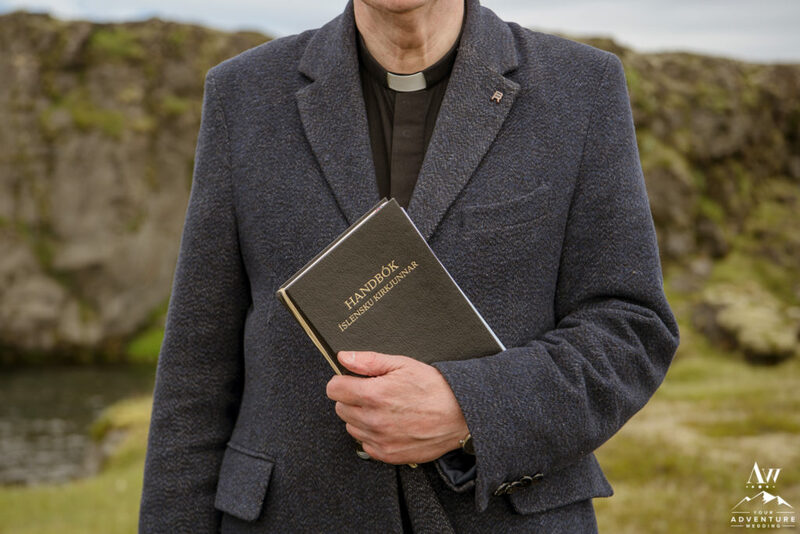 Being summer in Iceland, the sun rose before the adventure wedding start time of 5am. 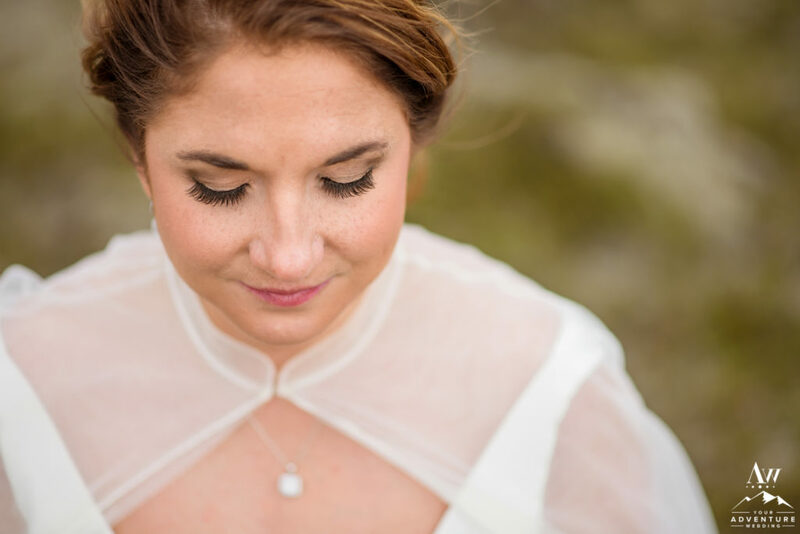 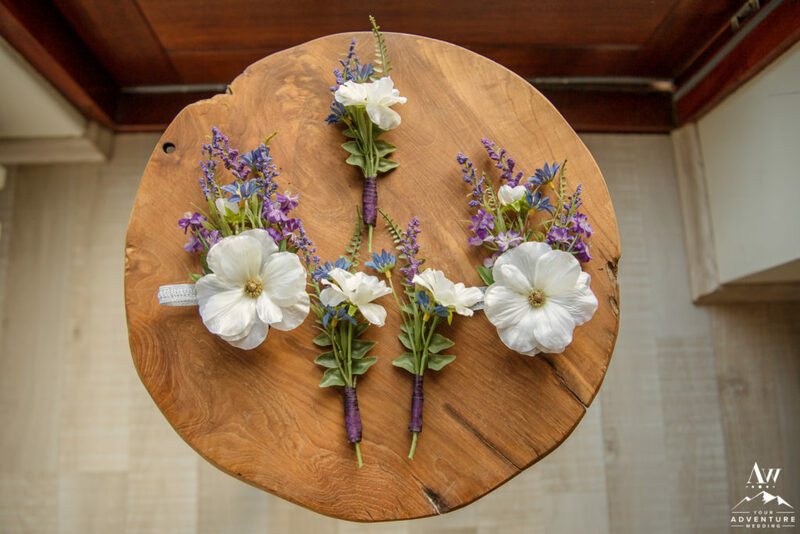 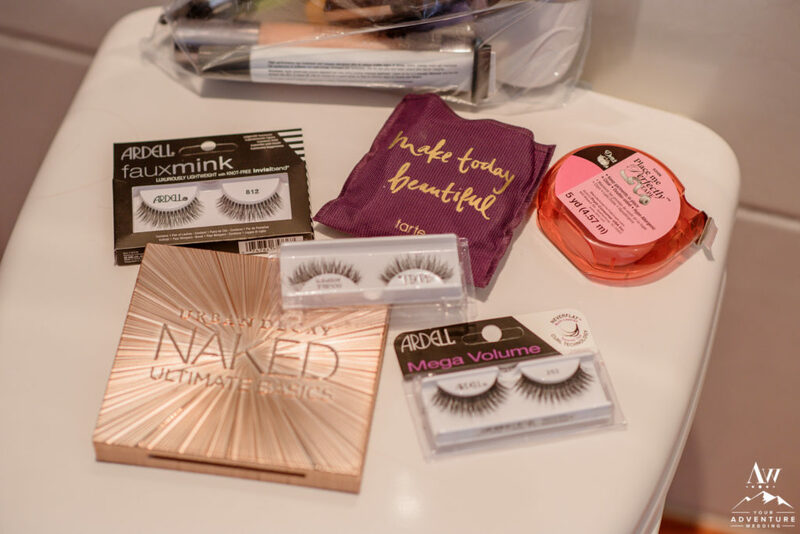 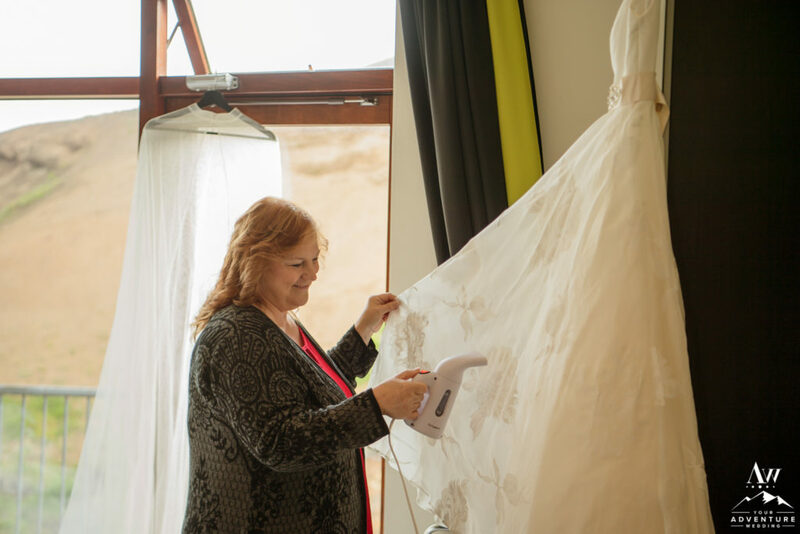 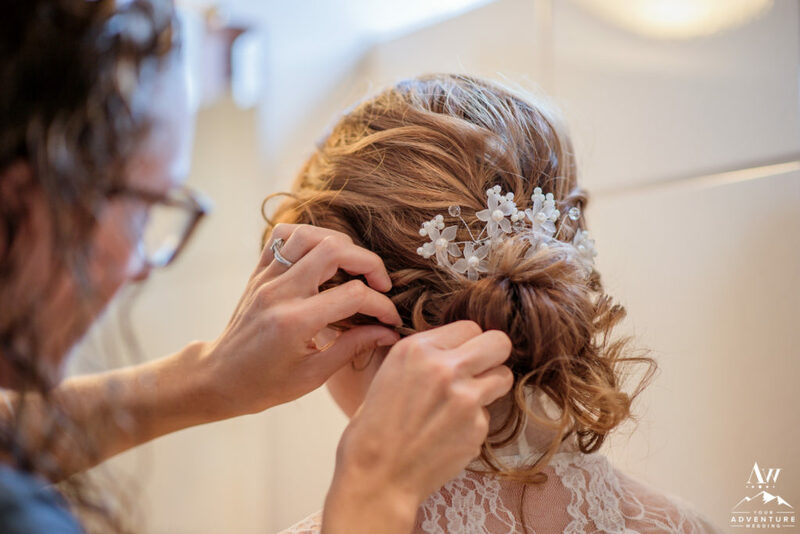 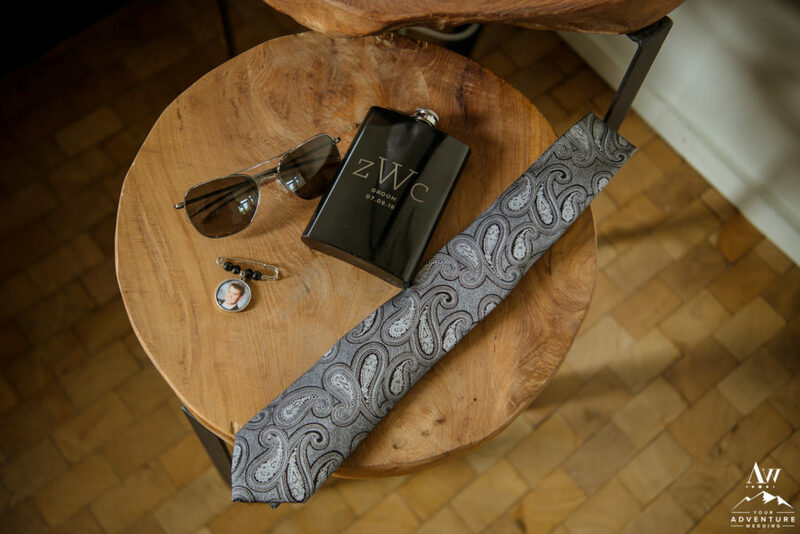 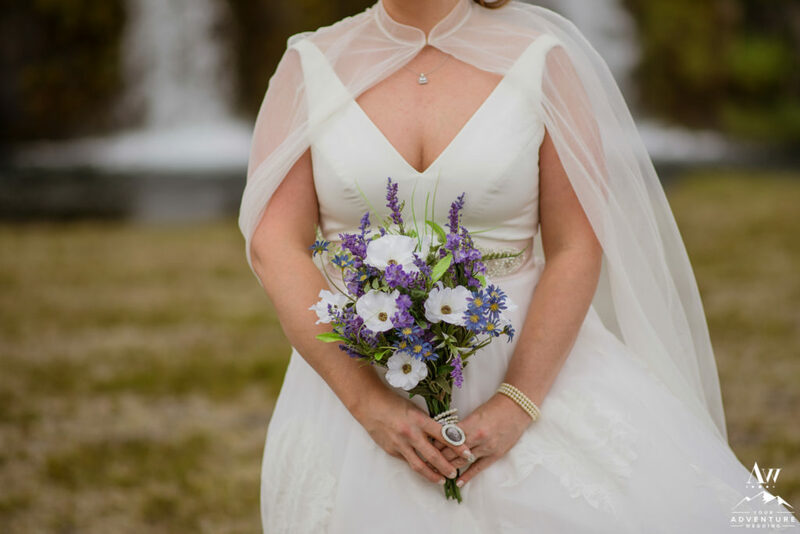 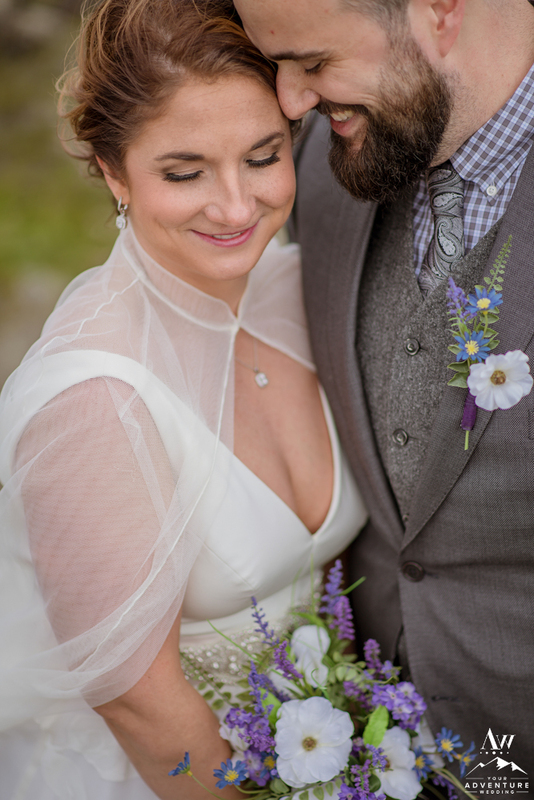 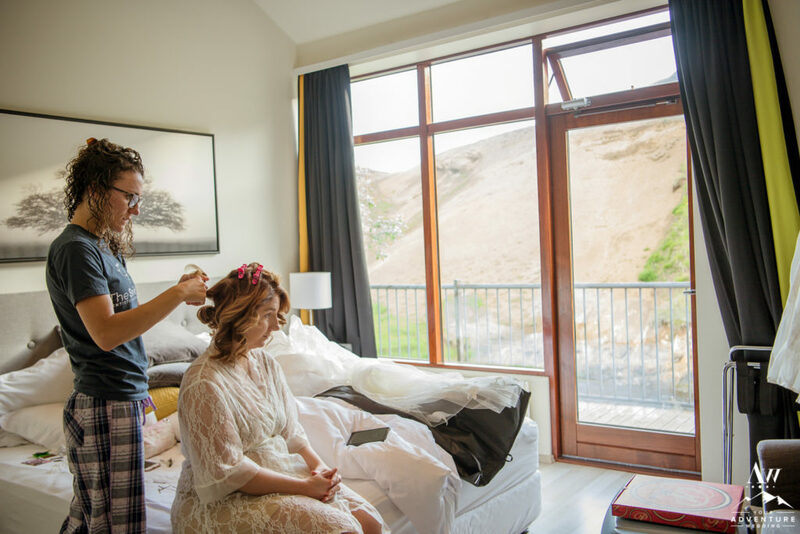 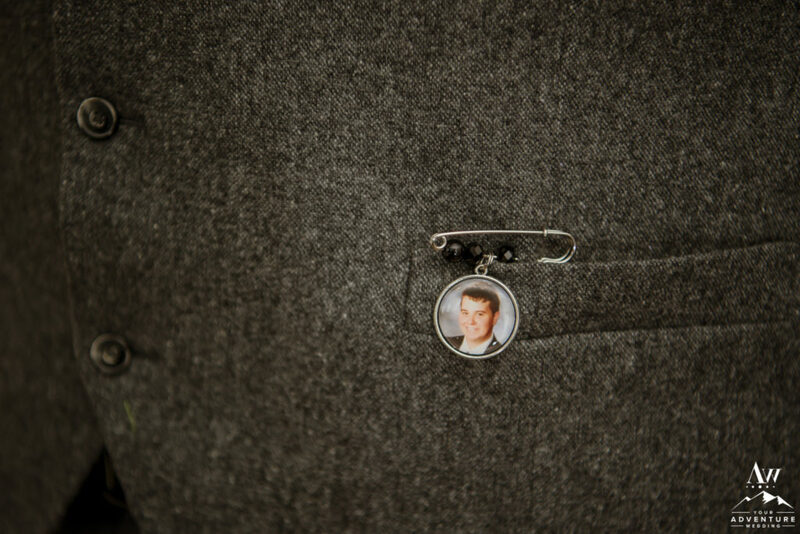 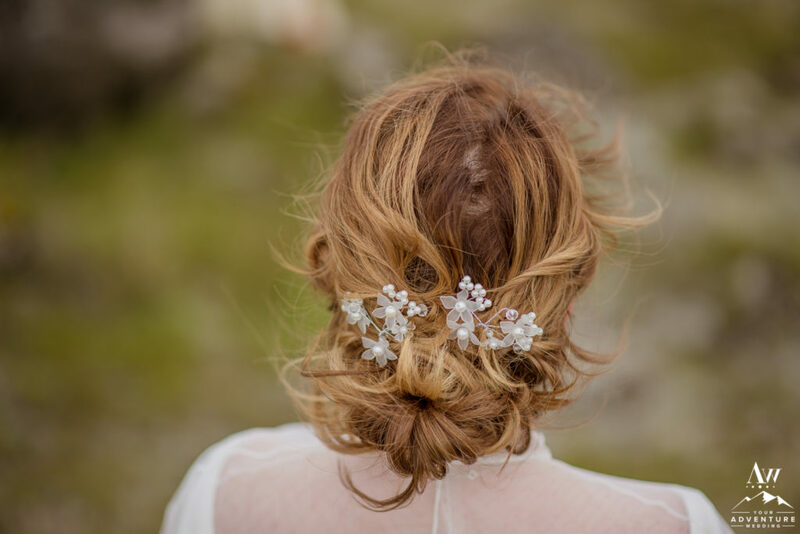 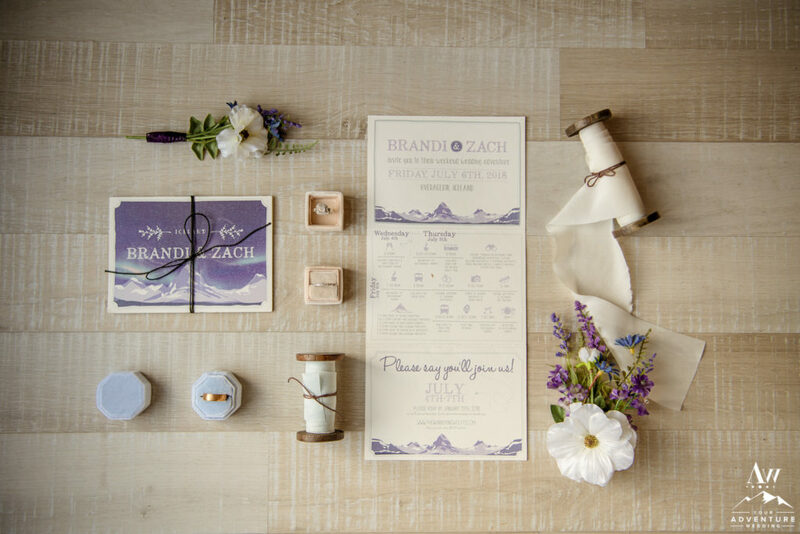 Our Iceland wedding photography team began photographing the getting ready process of hair and makeup along with the gorgeous wedding details Brandi and Zach had. 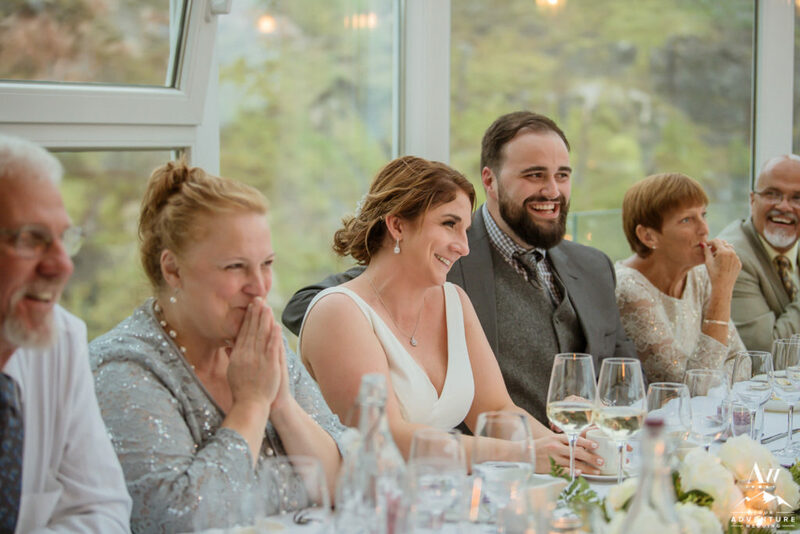 They decided the only traditional element they wished to keep from an American style wedding was not seeing each other before the ceremony. 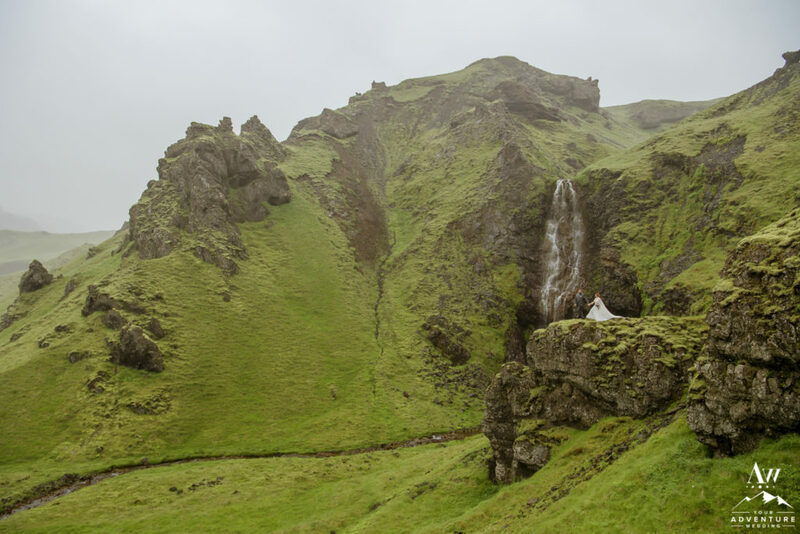 So when the super jeeps arrived, Brandi rode in one and Zach in the other and she would put on her dress upon arrival to their private waterfall. 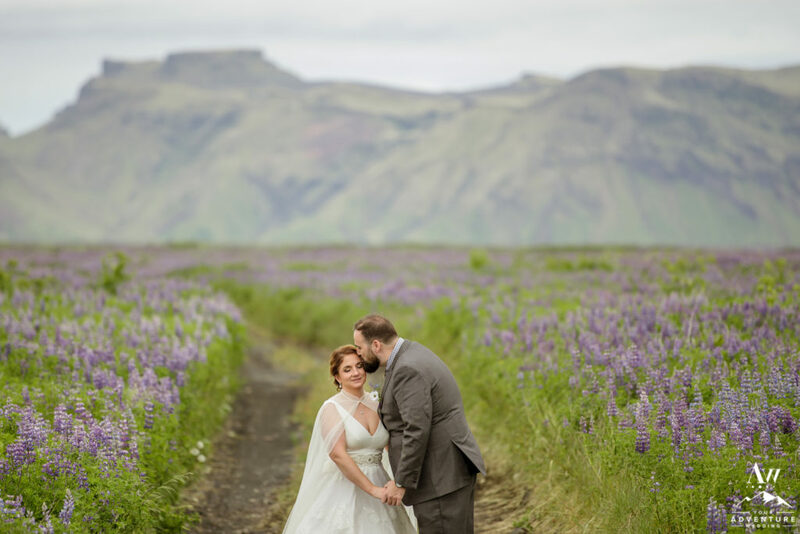 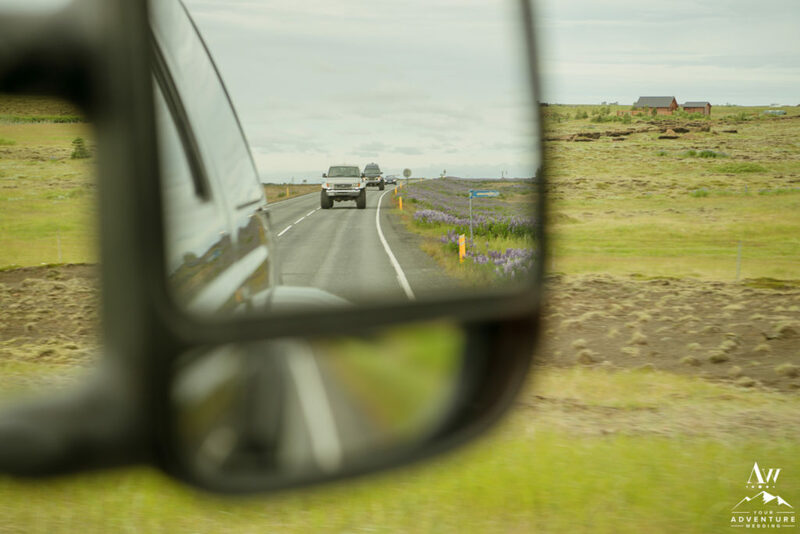 On the move to their stunning Iceland wedding location, each super jeep was brimming in excitement! 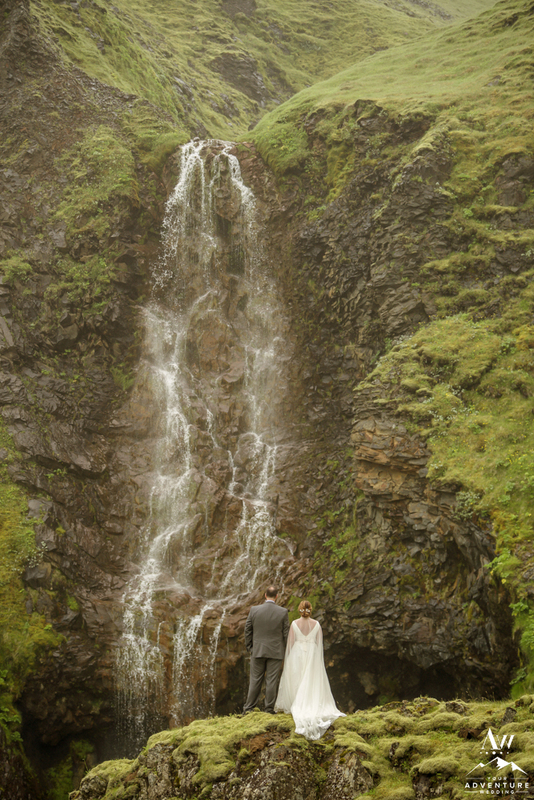 The guests knew they were heading to a waterfall but had no idea what type. 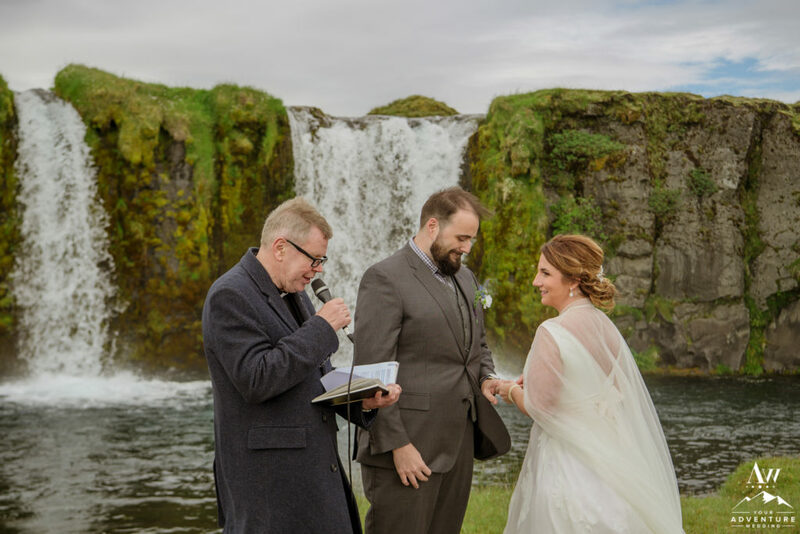 Pretty sure everyone’s jaw dropped as we crossed several rivers and arrived to Brandi and Zach’s Iceland private waterfall wedding ceremony location! 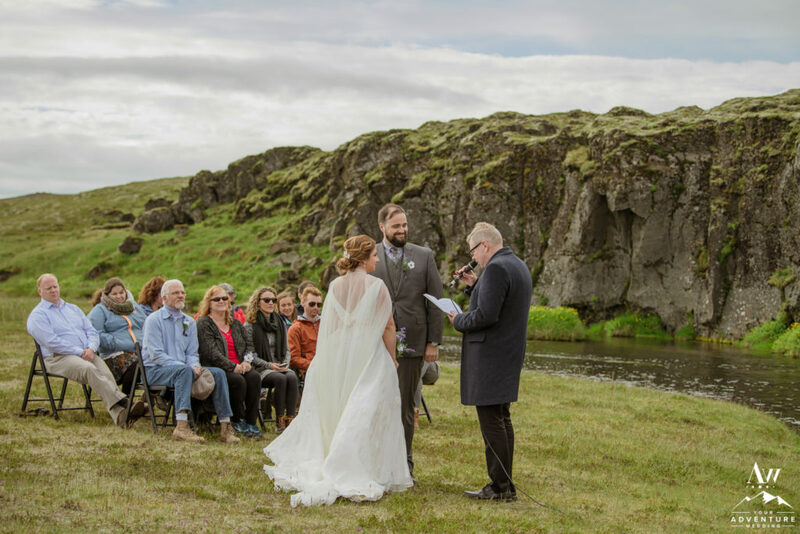 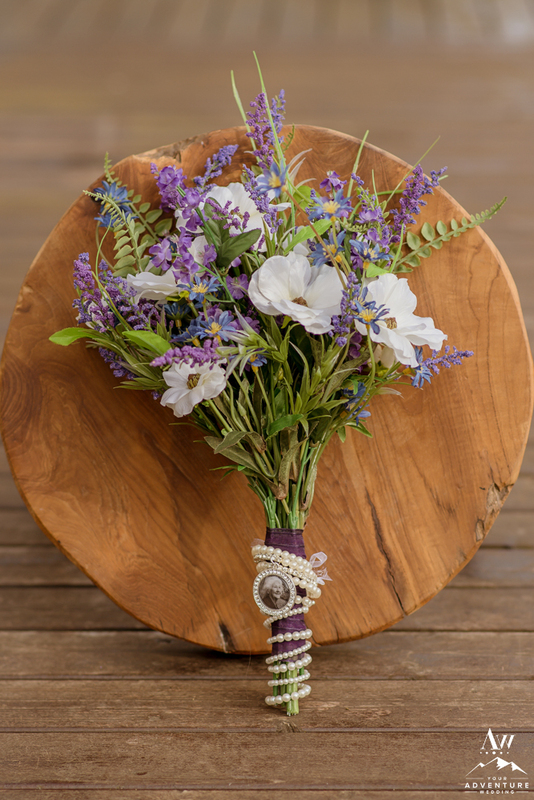 They held an organic adventure wedding ceremony where their 30+ guests watched in amazement. 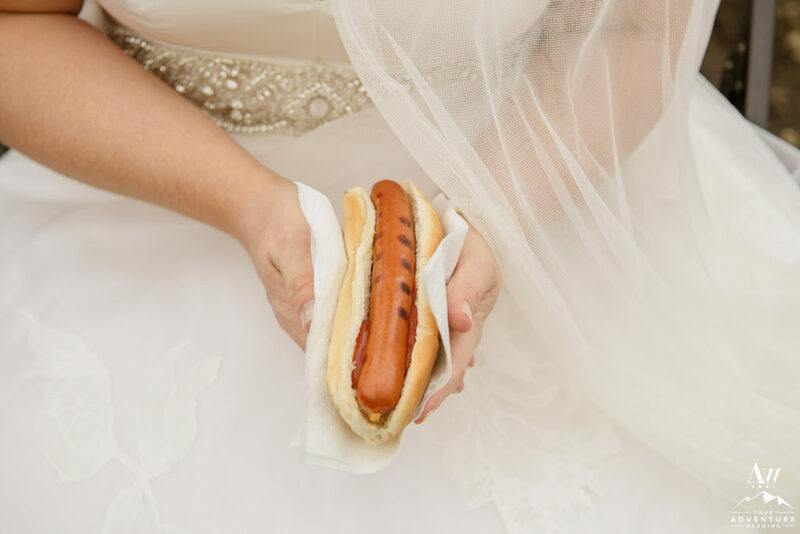 Immediately following they cheers’d the bride and groom and delighted in a traditional hot dog BBQ picnic. 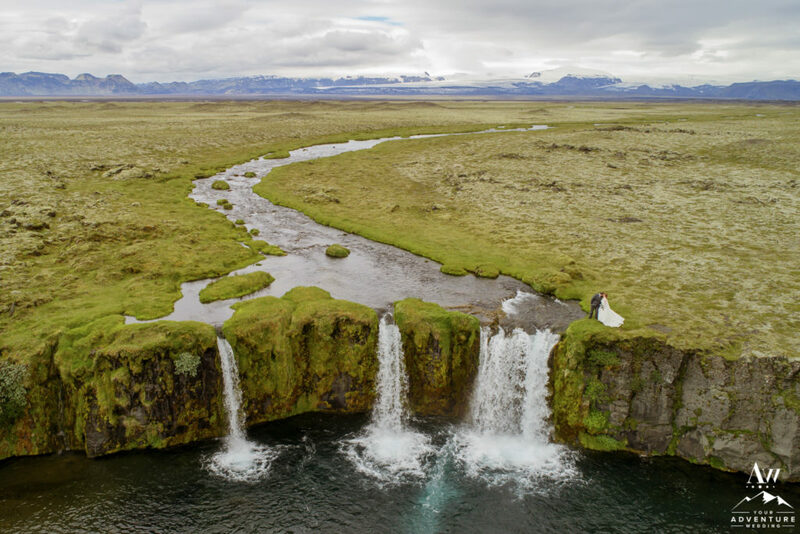 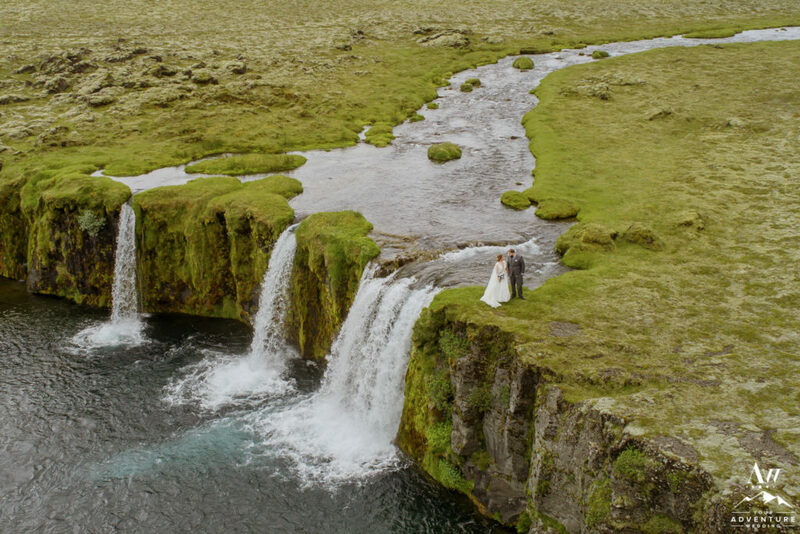 Having an Iceland wedding photography team that also has the ability to do drone photos is the perfect mix during your adventure. 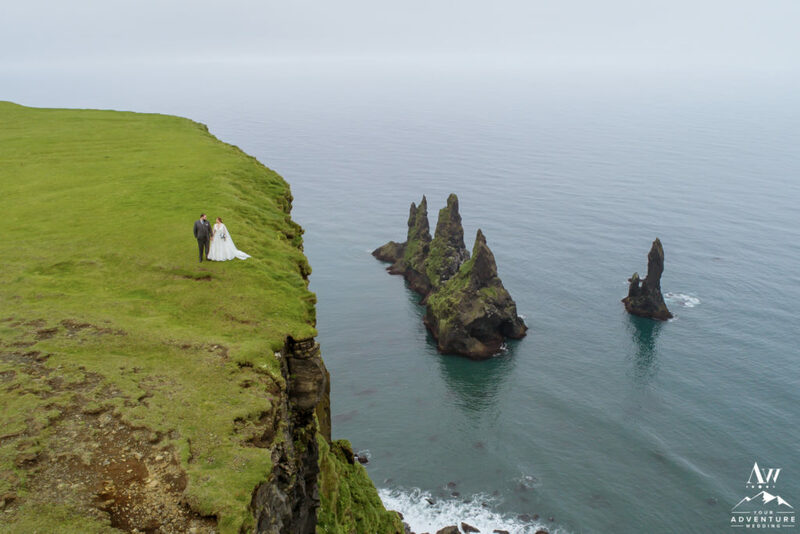 It really offers a unique viewpoint! 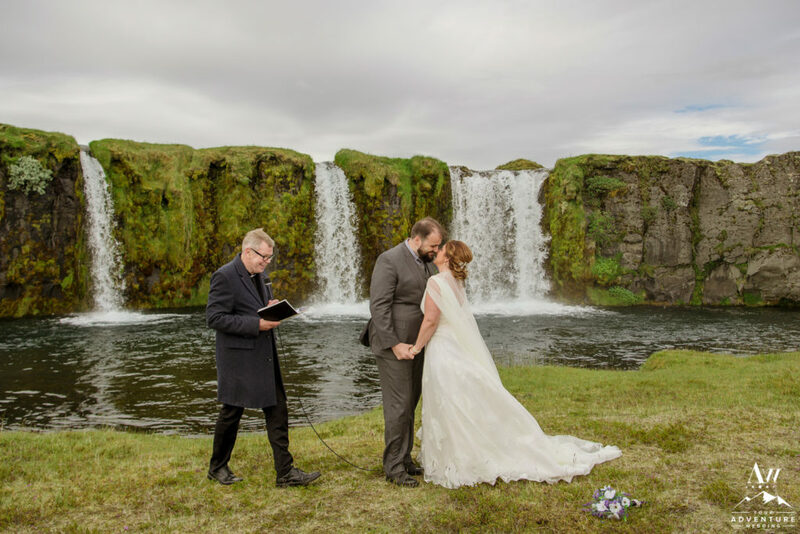 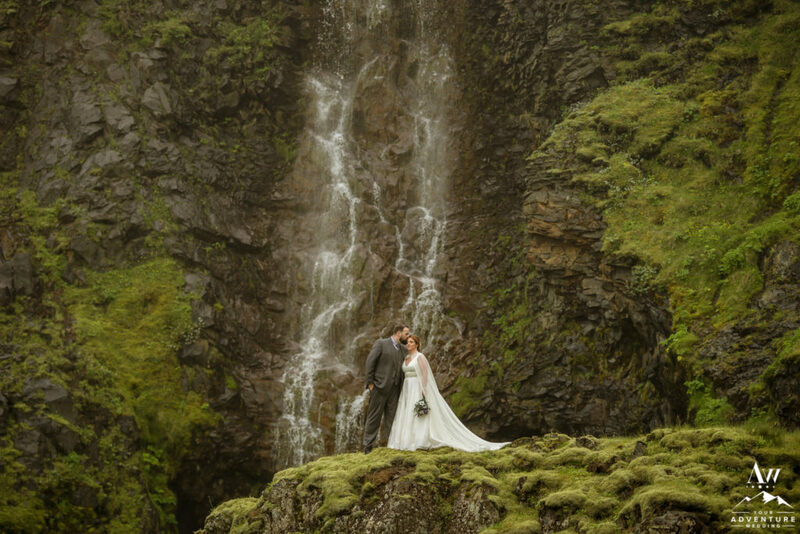 At this private waterfall in Iceland there are many vantage points though for romantic wedding photos. 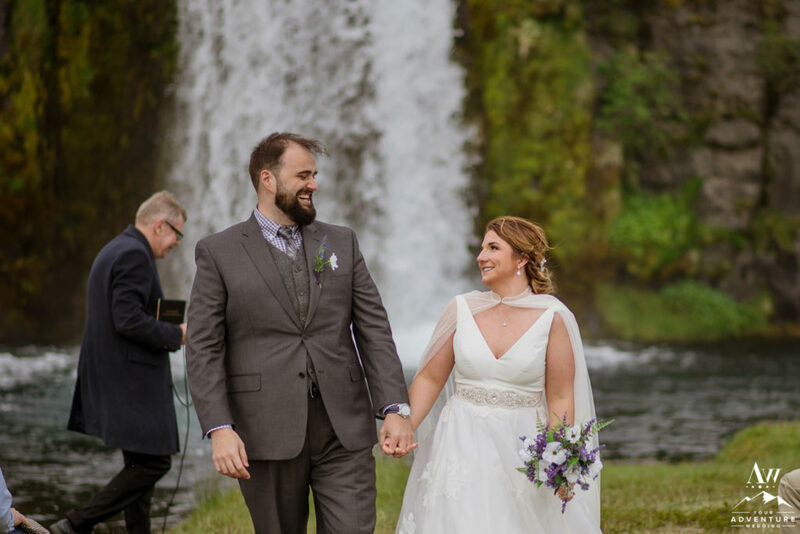 Brandi and Zach enjoyed exploring the beautiful organic adventure wedding waterfall from head to toe and all around the area alongside of their wedding guests! 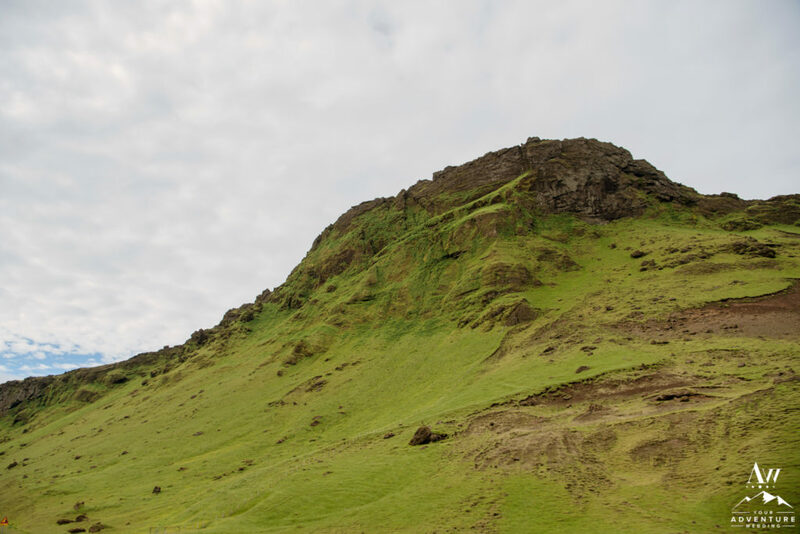 The mysterious cliffs over Vik Iceland has an interesting story attached to them. 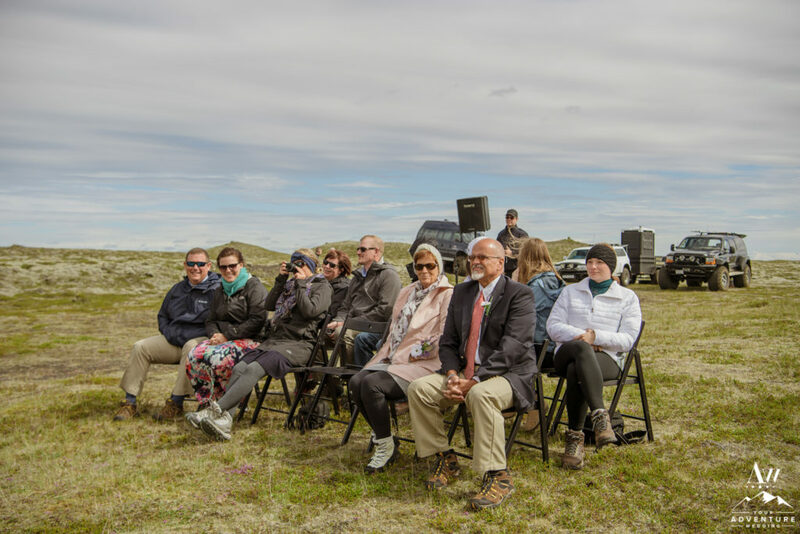 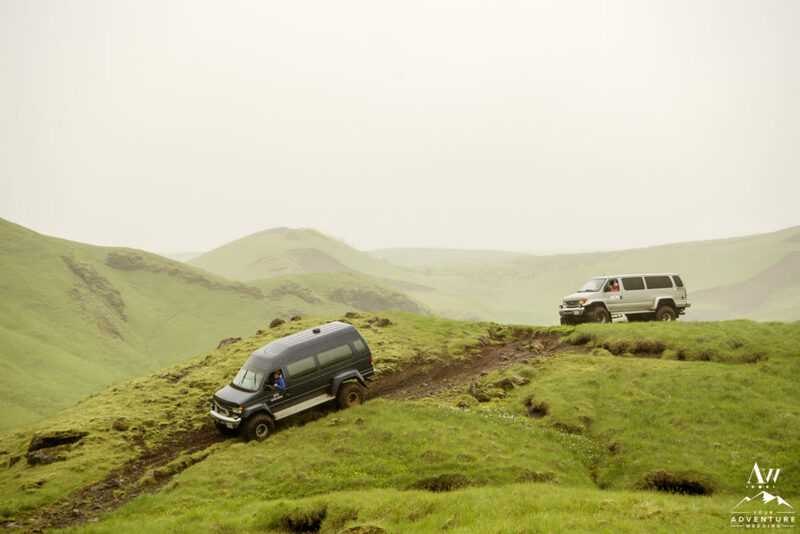 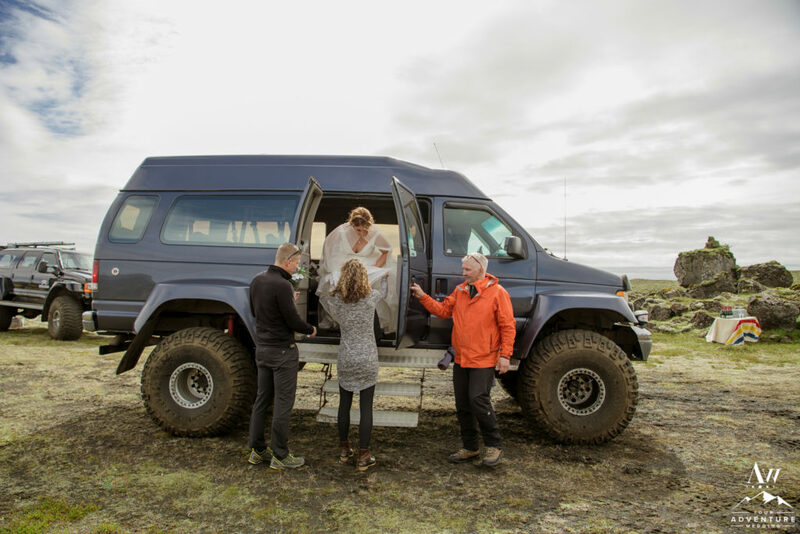 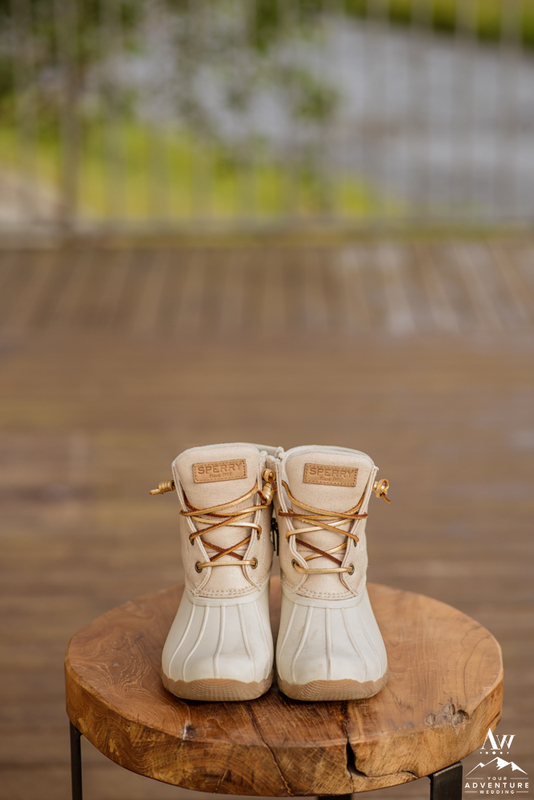 It involves the US military and our Iceland Wedding Planner and super jeep team would love to share the story with you! 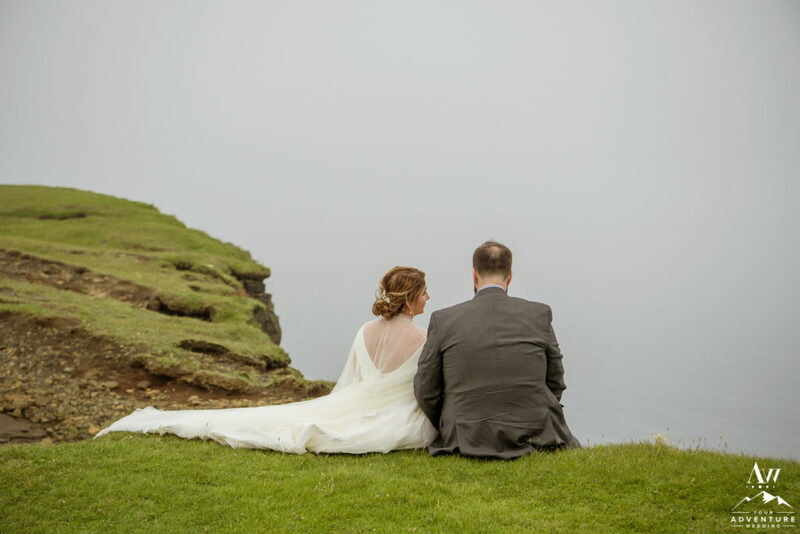 The view in all directions really added to the organic adventure wedding theme. 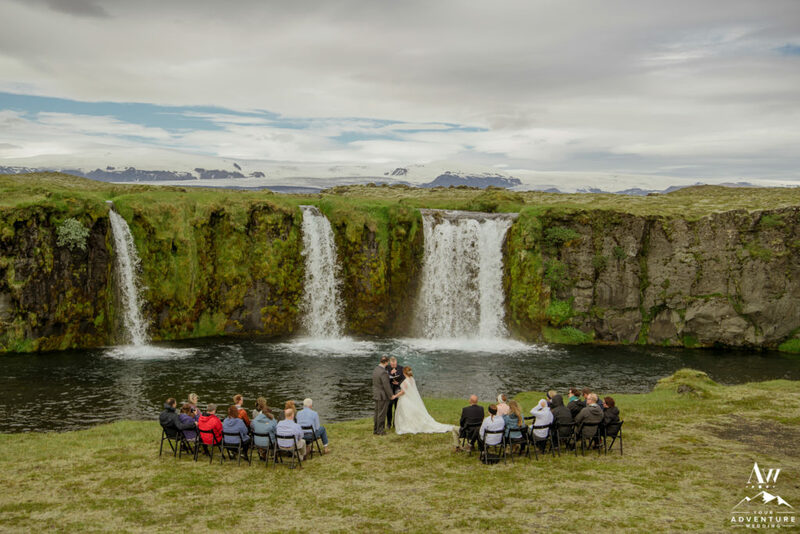 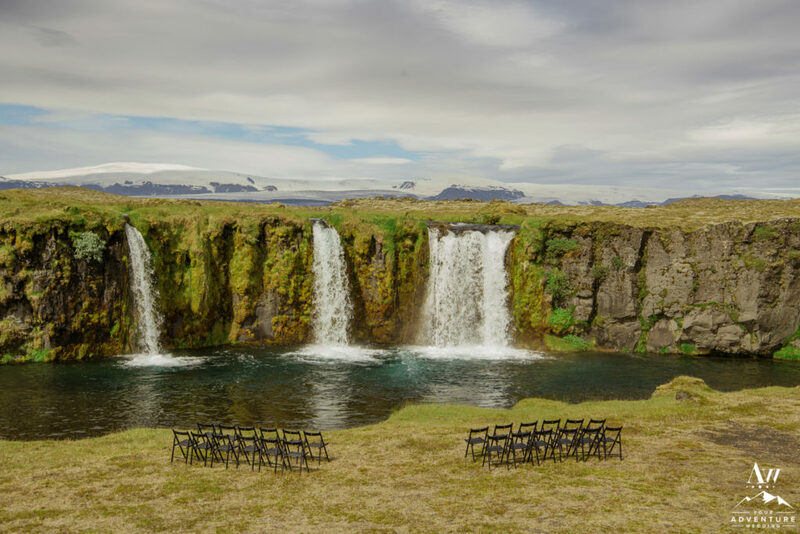 Nothing beats having a location all to yourself… Our Iceland Wedding Planner team specializes in securing those types of unique locations so you feel like the only ones in the world there exploring! 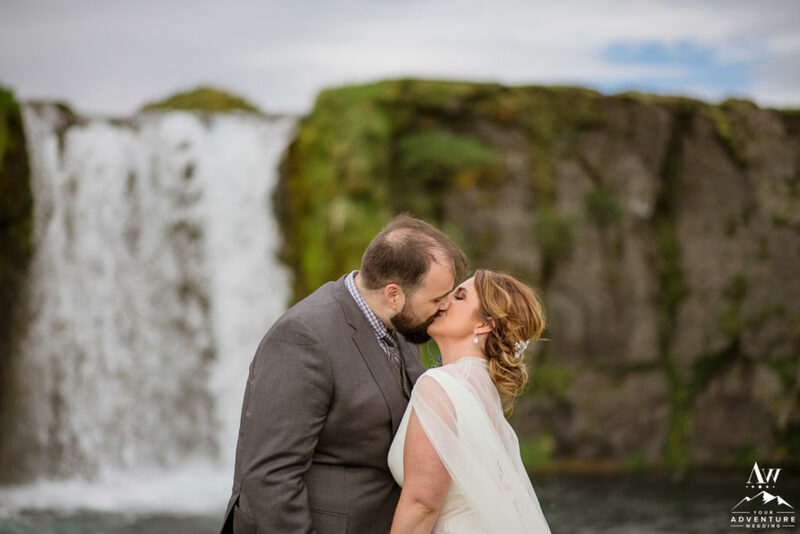 The last two locations on Brandi and Zach’s organic adventure wedding exploration list were a private narrow super green canyon followed by another private waterfall! 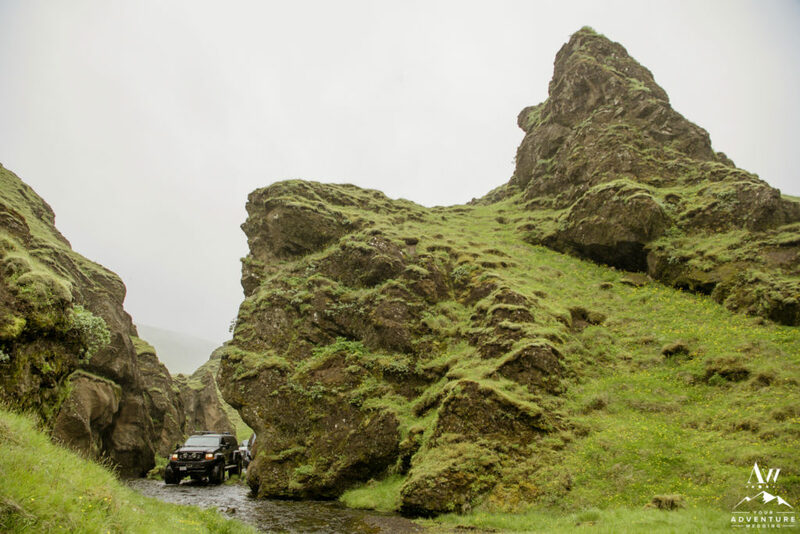 These two LOVED exploring both and the amazing super jeep ride that got them there! 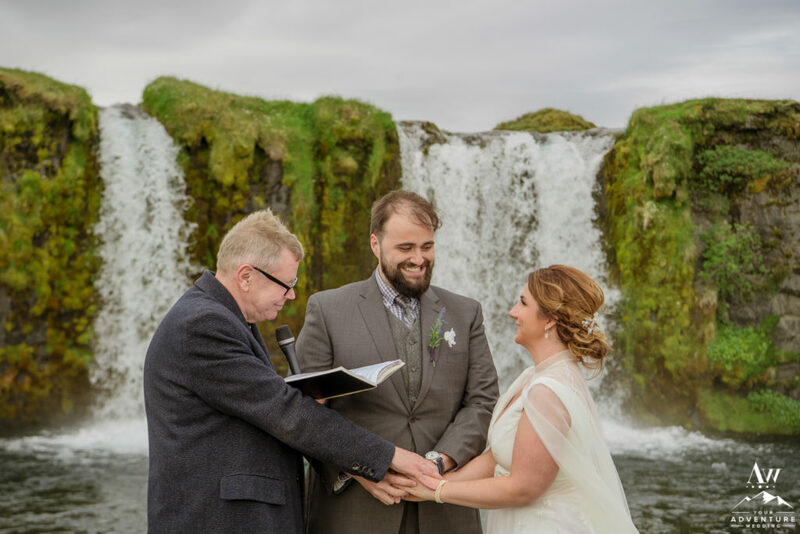 They truly gifted their guests with such a unique experience during their adventure wedding in Iceland!! 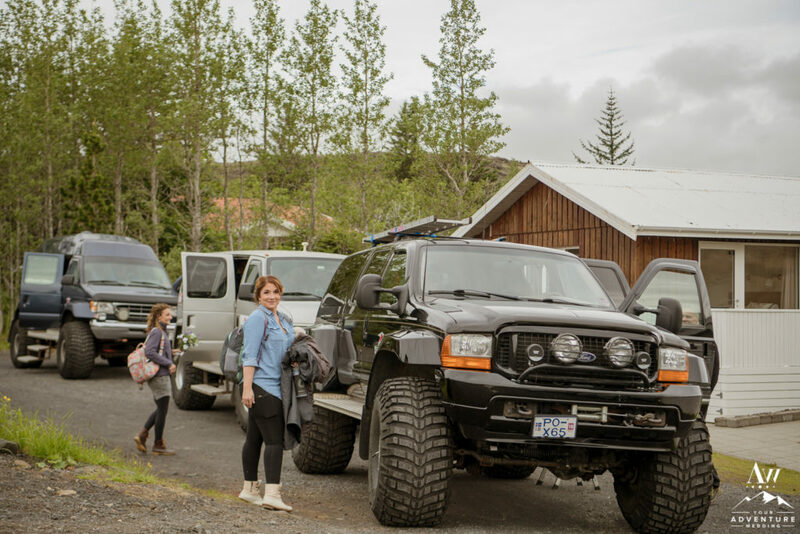 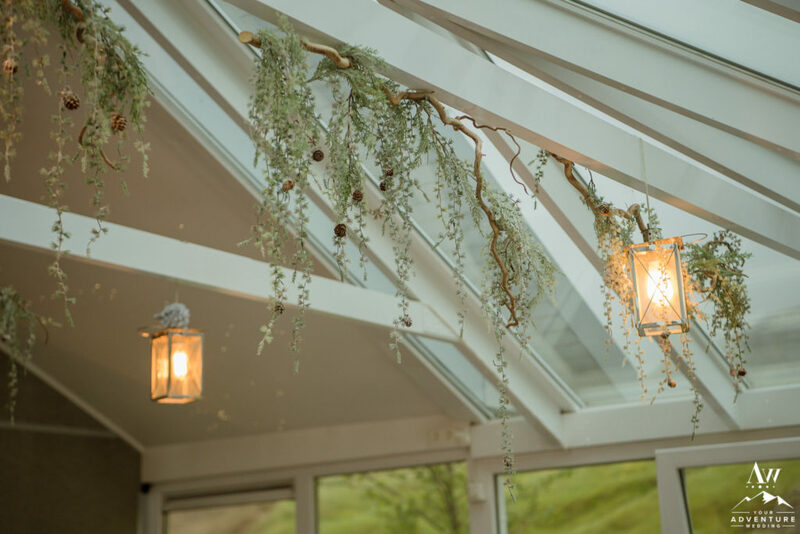 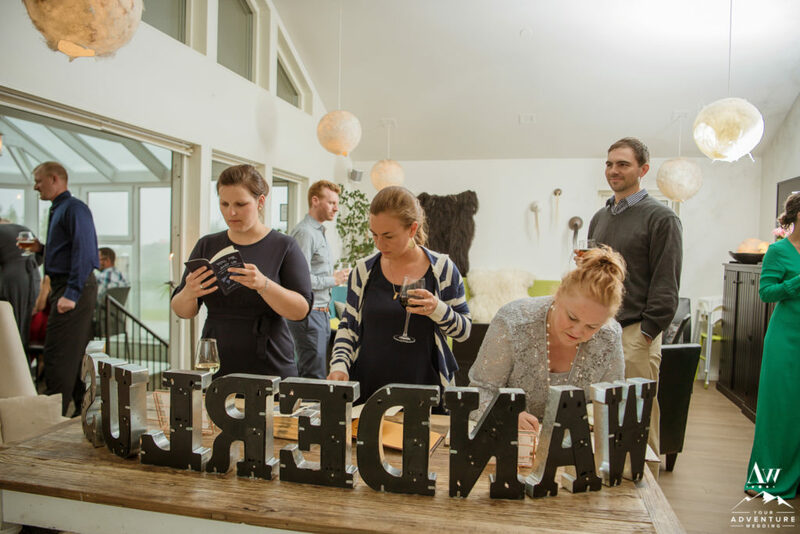 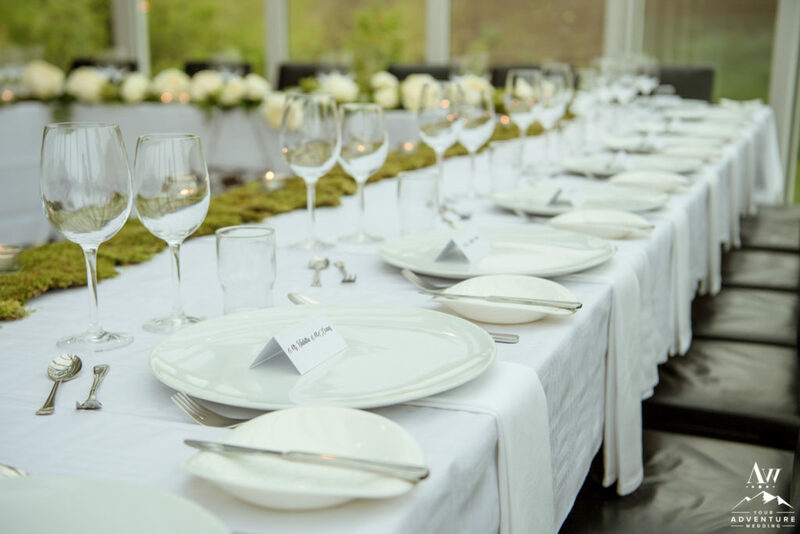 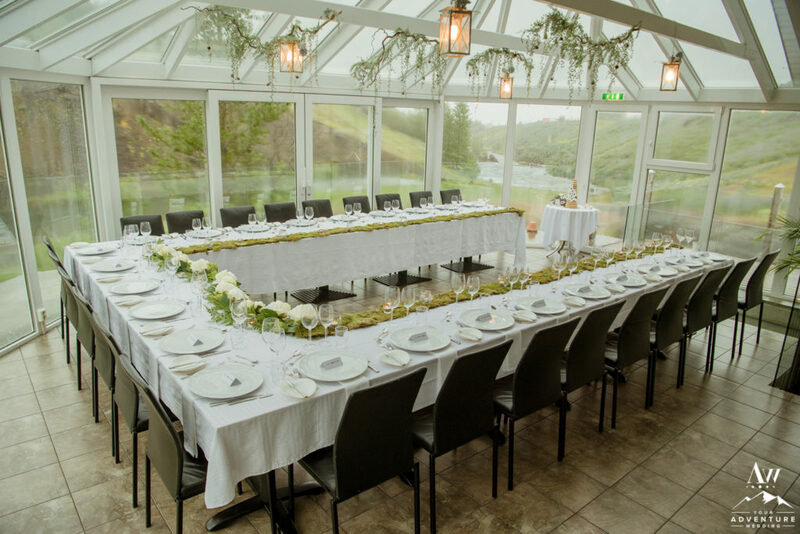 The Iceland wedding guests had about 30-45 minutes to rest and refresh before meeting again inside of the perfectly styled organic adventure wedding reception restaurant Varma! 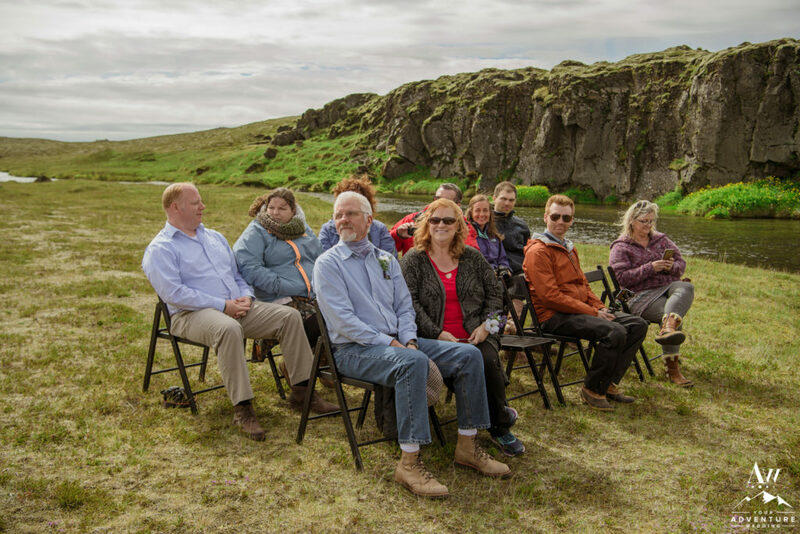 The seating was in a “U” shape which allowed everyone to set their eyes on the geothermal mountains and raging river Frost og Funi Guesthouse sits upon. 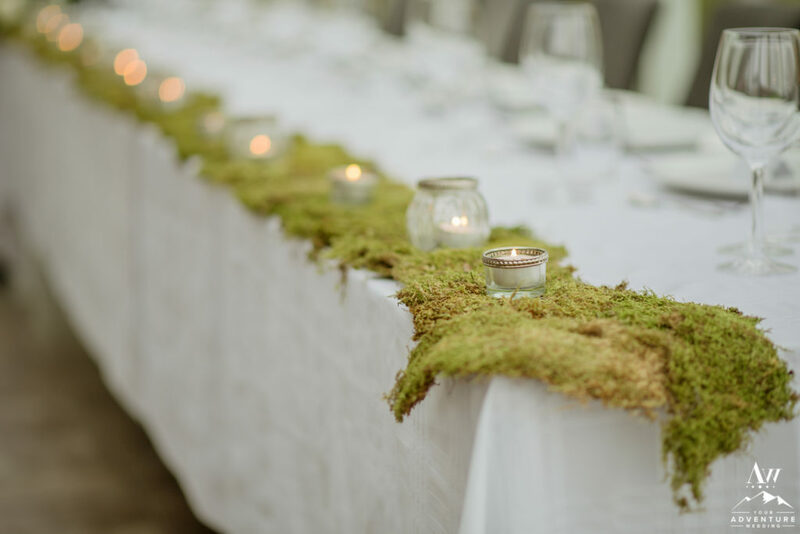 The Iceland wedding reception decor theme was simplistic with moss and romantic candles. 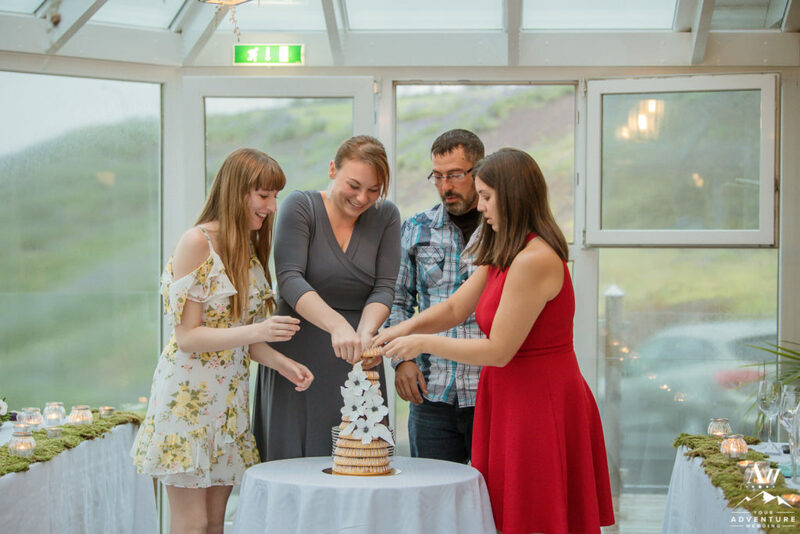 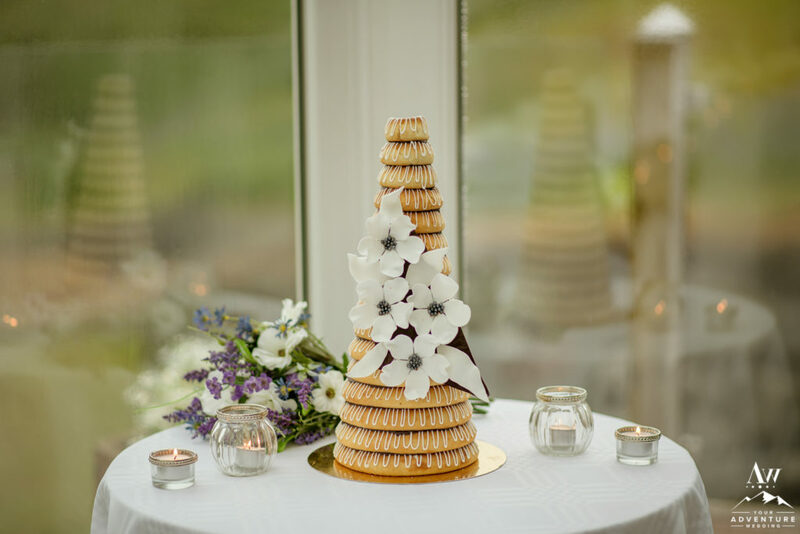 A traditional Iceland wedding cake (kransakaka) sat in the corner just waiting for the group to partake after their 4 courses.